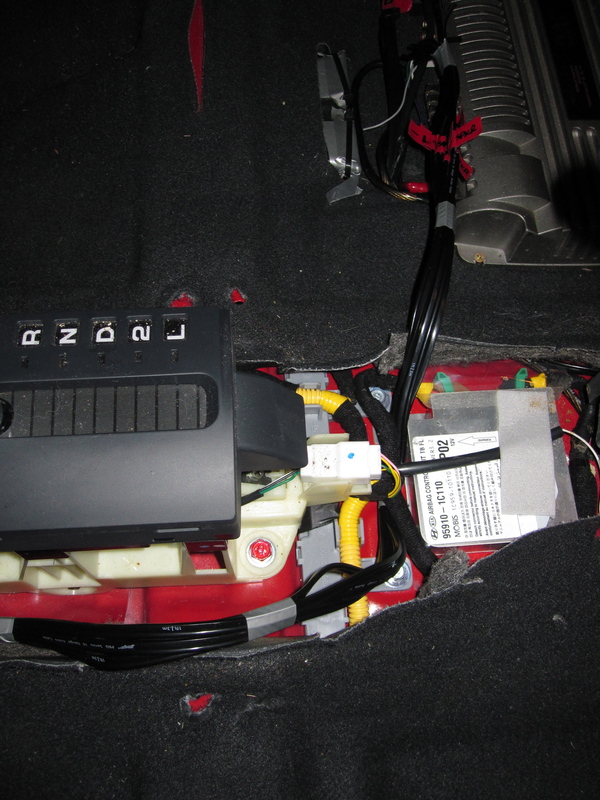 Previously, we have put the power cable through the firewall, attached a fuse and mounted it near the battery. The connection has been sitting there cable tied, waiting for us to connect it. The extra grounding has already been done (as you can see on the negative side) but the power needs to be connected to the positive terminal. To do this, the cover needs to be removed. Conveniently there is a bolt holding another connection, so you can use this to also attach the positive cable. It’s pretty much as easy as undoing the nut and slipping the eyelet over the bolt. Then reattach the nut. I disconnected the battery as I felt this was a bit safer – just make sure you’re careful! So now all that’s left to do is to turn the whole thing on and listen to the AWESOME POWER OF THE NEW STEREO!!! ….except that when I did that, it didn’t work. The factory head unit wouldn’t play. I worked out pretty quickly that because I has disconnected the battery, the head unit had kicked in the security control and required a password to reactivate. Where the hell do you get the password from and how do you enter it!!??!! 5. Use the “1” button on the head unit to enter the number. Keep pressing it until it reads (in this case) 0. 6. Use the “2” button on the head unit to enter the number. Keep pressing it until it reads (in this case) 7. 7. Use the “3” button on the head unit to enter the number. Keep pressing it until it reads (in this case) 3. 8. Use the “4” button on the head unit to enter the number. Keep pressing it until it reads (in this case) 5. 9. Press the number “5” button to accept the password. I did all of this and it worked! Everything was fine. I turned on the stereo and played a cd and it sounded great. Not AMAZING, but great. That meant I had to tune the amp a little. To tune the amp, all I did was find the two tuning pots (little dials that require a screwdriver to turn) and move them. 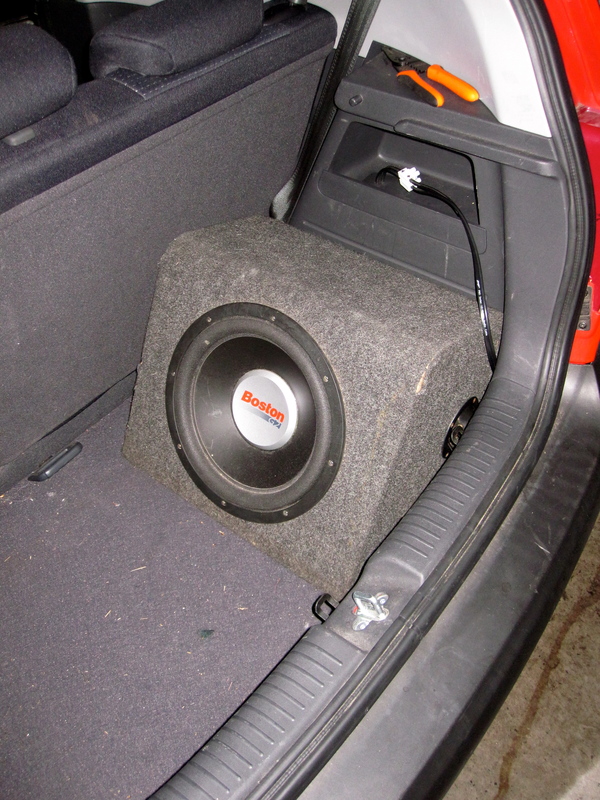 I thought the sub was a little loud for the car, so I turned it down a fair bit. I also turned down the gain. The idea behind the gain is to turn the dial to about medium and then turn the volume on the stereo up until it starts to distort. Turn the gain down a little and the stereo up until you get to a point where the top limit of the stereo is just distorting – then turn the gain down slightly. This means that even at full volume, you can’t blow the speakers. You should also tune the sub to suit the sound as well. I found that the sub was too loud and drowned out the music, so I turned it substantially down. I then played with different volumes and adjusted the sub volume until it seemed about right. I did find that the sub seemed to be a little off in relation to the music and this is quite often cause by being “out of phase”. Some amps have a switch to change the “phase” on the sub, but this one didn’t. The difference in the phase, put simply, is whether the speaker goes positive to negative or negative to positive. I got around this by changing the wires on the sub itself. This reversed the phase and sounded MUCH better. After having made these tweaks, I tried it again and now it sounds AMAZING! (Well for the money spent anyway). I also recommend making these adjustment as far away from houses as possible so that you don’t get hassled or disturb anyone. 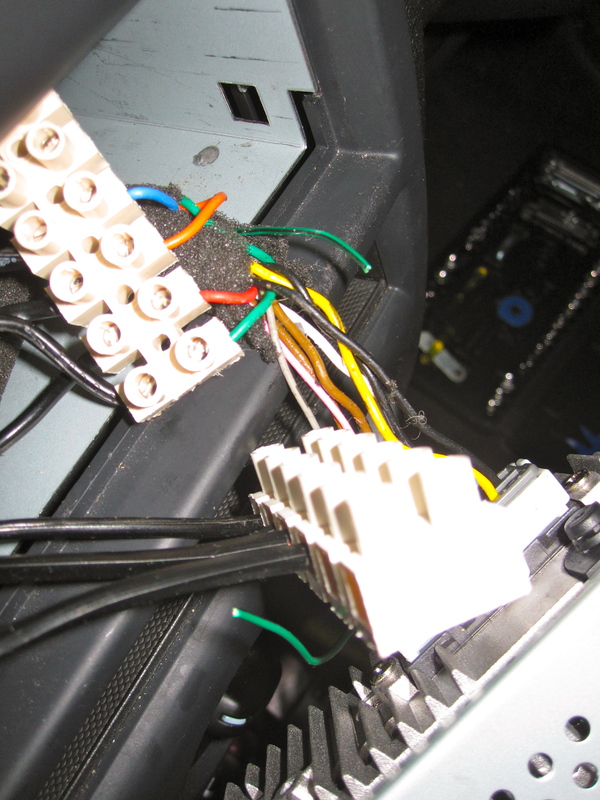 I have used the “lego block” connectors behind the head unit. This isn’t ideal, but it’s okay. 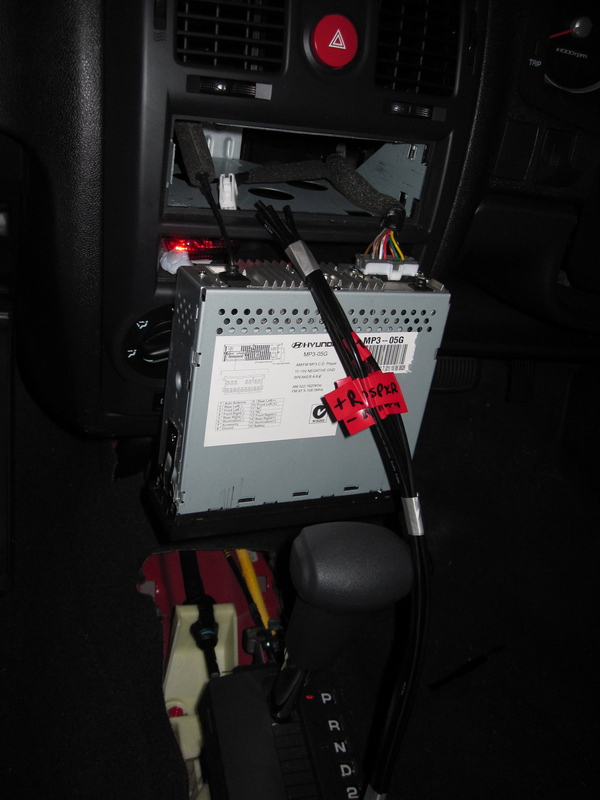 The reason I did this is so that in future if the owner wants to replace the head unit, the wires are still there and as long as they have ever been (which is quite short). If the wires were joined and soldered, etc, they would need to be cut and rejoined – more difficult, the shorter the wires are. There could probably be more dynamat applied in the front doors, roof, and boot, etc. I did pretty much a bit more than minimum, but it did the job. One of the fuses in the amp was missing when I bought it. 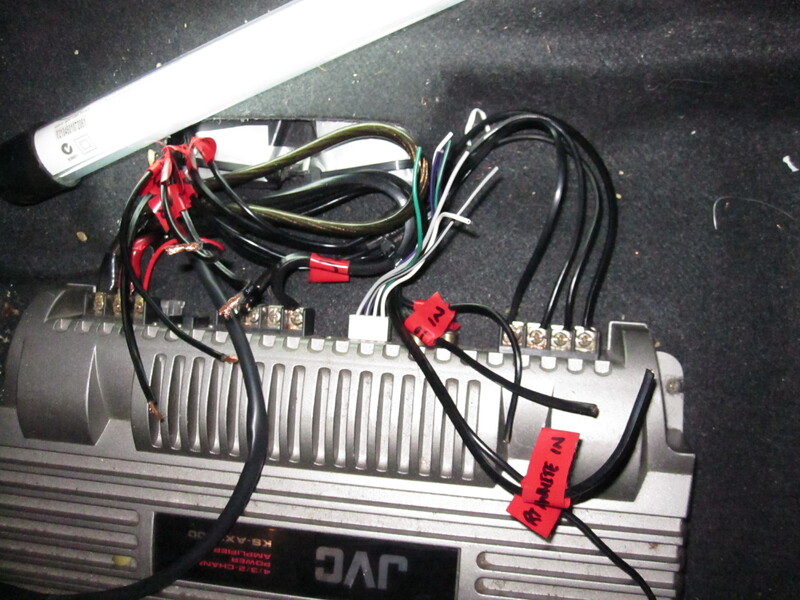 I replaced BOTH fuses (25a) with fuses that have a little LED light in them that glows if the fuse is blown. They only cost a few cents extra and I thought that would be a cool feature, making it easy to see why the stereo isn’t working. 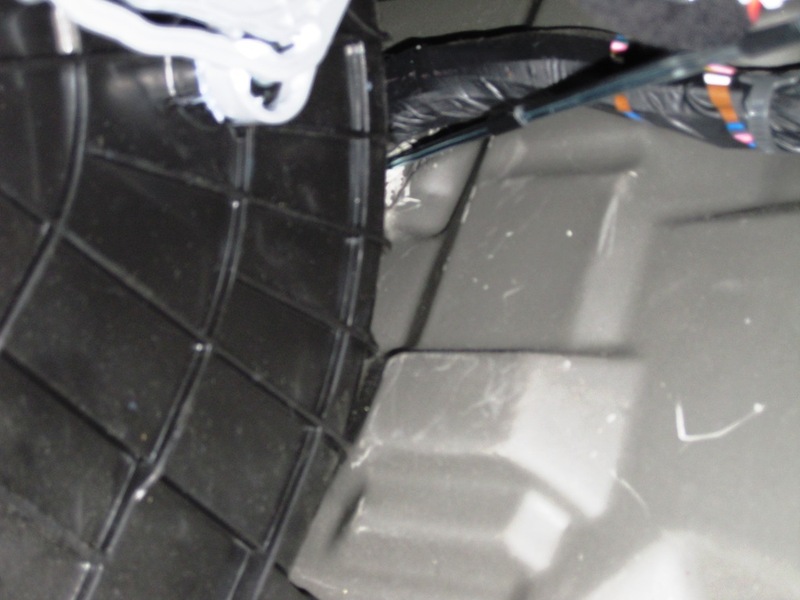 I would also recommend that some sort of cover be put over the sub speaker since there is a good chance it could get damaged in the boot. However, if the owner is careful it isn’t that necessary. Well, now I didn’t think it would ever come to this, but I have finally finished the stereo install in the Getz. It’s been almost a year and a half, but the end result was worth it. It should also be said that I haven’t had access to the car the whole time and every time I did work on it I would have to put it back together to return it. .The next step is to get ready to do all the wiring connections. It’s always easier to have everything at hand, rather than needing to leave what you’re doing to get a tool. The photo below shows all the things you need to make the connections. – Ratchet socket thing. This isn’t actually necessary for the wiring, but I used it to take the chair out. – Heat shrink. These are the blue and red strips. We’ll be cutting these to put around the joined wires. – Scissors. You’ll need these to cut the heat shrink. – Wire Stripping Tool. This is worth the $5 investment since it just makes things easier when stripping the wires. – Light. Unless you have heaps of natural light, it’s good to see what you’re doing. – Yoga/camping mat. 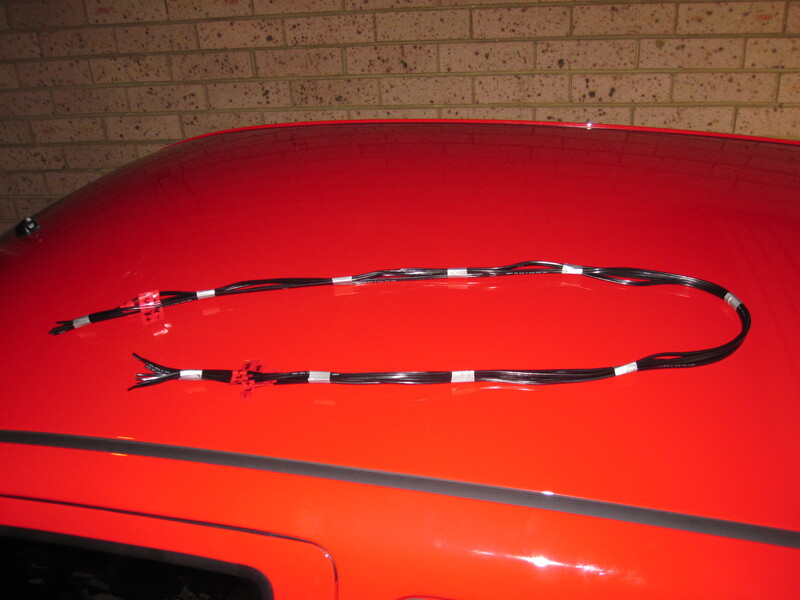 This is a couple of dollars from a dodgy shop and saves your knees when you need to kneel next to the car. This is maybe one of the best purchases I have ever made. – Solder. You’ll need some of this to solder the wire joins together. A roll lasts forever. – Soldering Iron. This is to melt the solder onto the wires and is plugged in heating up while you get everything else ready. Just keep the tip away from wires and the mat. – Adidas Gazelles. Essential for looking cool while you work on the car. Now that everything is ready, I noticed that the wires are a little short and could do with extending a little to ensure there’s no pulling and breaking. I needed to cut a little extra to join everything up. Therefore I cut enough pieces to do this and put them together in sets – the round wires are for negative and the square wires are for positive. 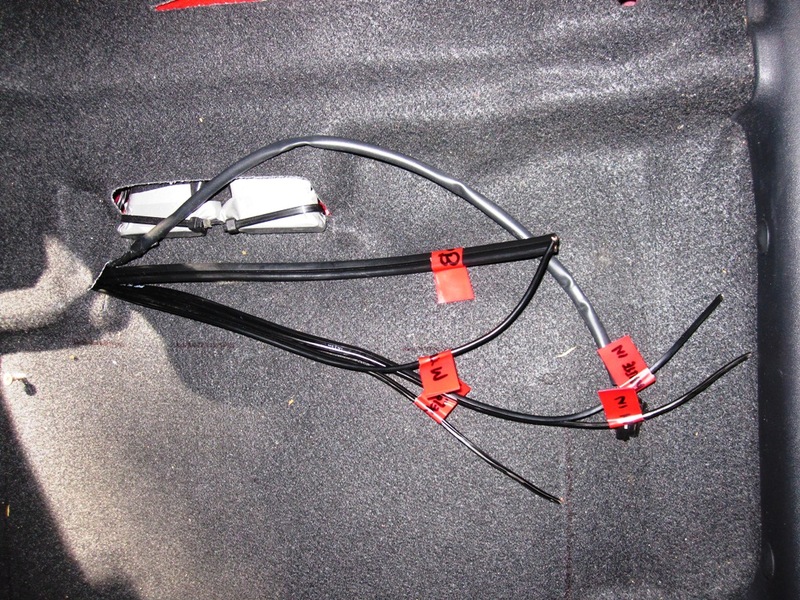 These wires will be to go from the amp to the speakers so we need to find the wires that are labelled to go to the speakers and connect them to the amp. 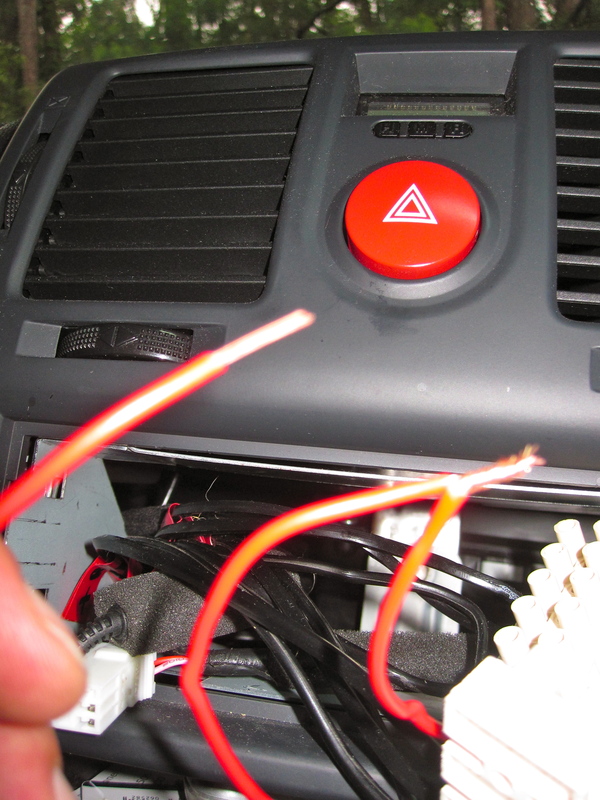 The first thing to do is to put the heat shrink onto the wire you’re going to join. 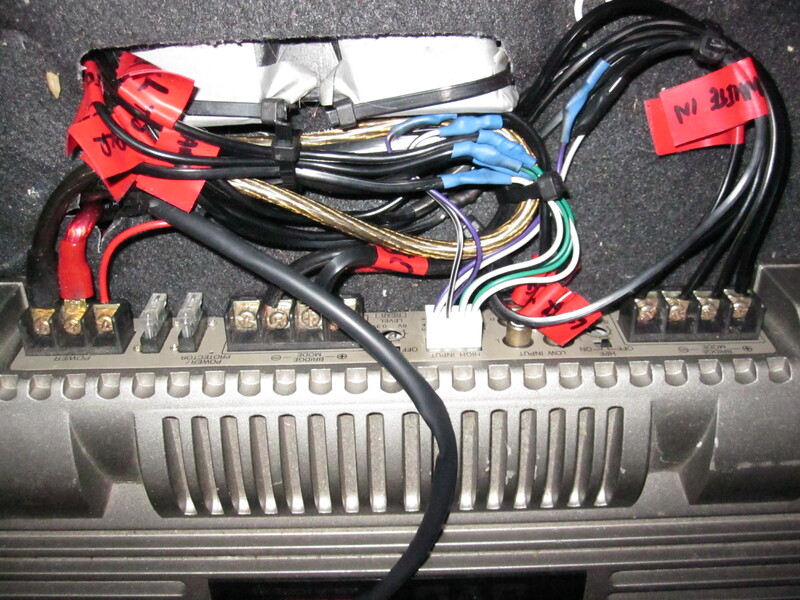 The sub wires are already connected to the amp, but the fronts are not. There will be four wires, left + and – and right + and -. Strip both ends and then twist, join and solder (see photo below). Once joined, pull the heat shrink over them and heat. The amp has written on it which wires go to where and it’s just a matter of making sure the wire with the right label goes to the right connection on the amp. We won’t be able to test this until the end, so check twice. 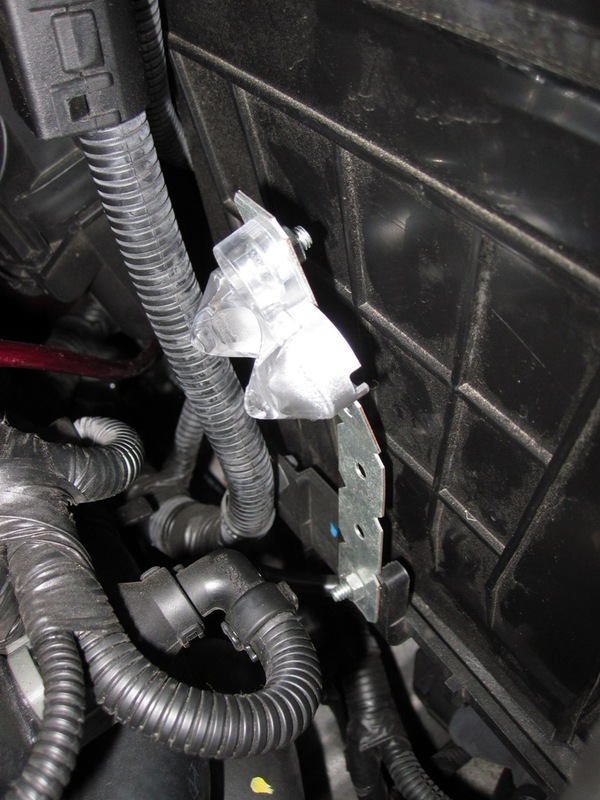 When screwing down the connection, try to get a bit of the plastic wire cover in there as well so that it’s less likely to get pulled out. 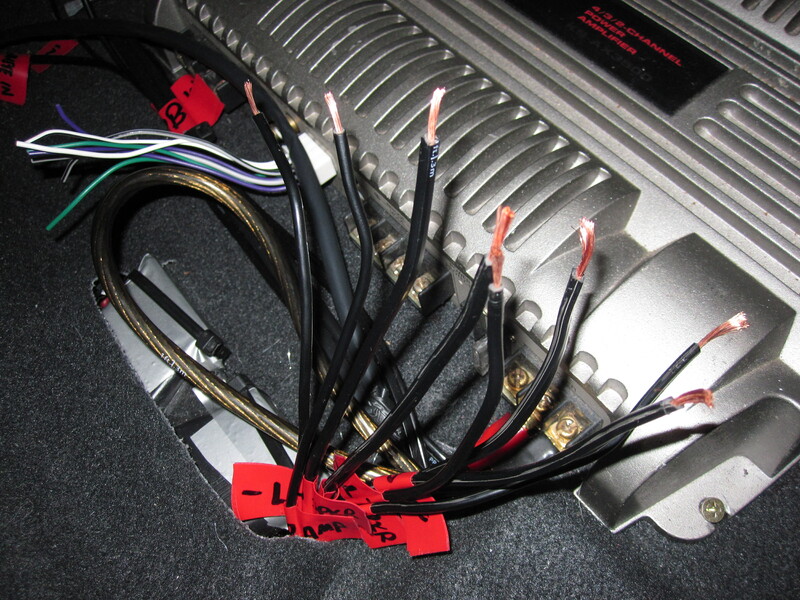 Once all four amp-to-speaker wires are in it should look like this. Try to keep them all together so we can cable tie them neatly later on. 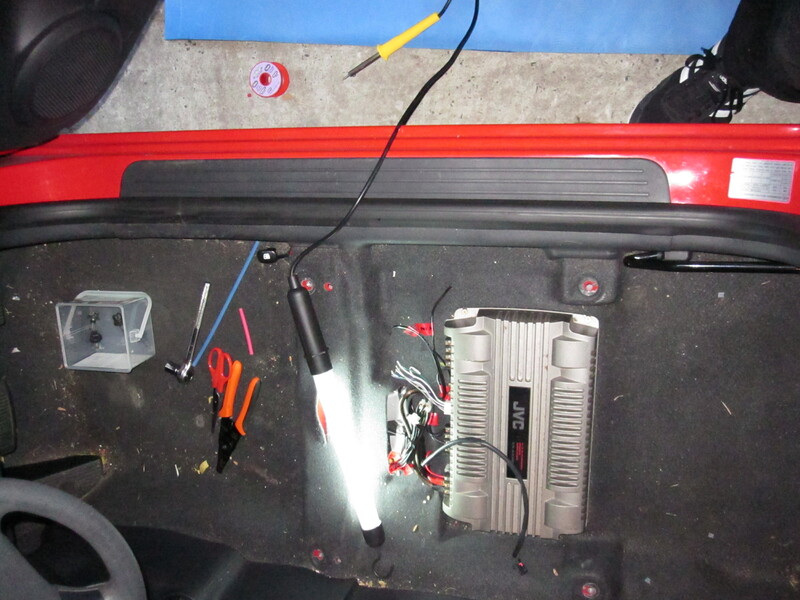 The next step is to connect the wires from the head unit to the amp. This is a little difficult since they need to connect to the harness. 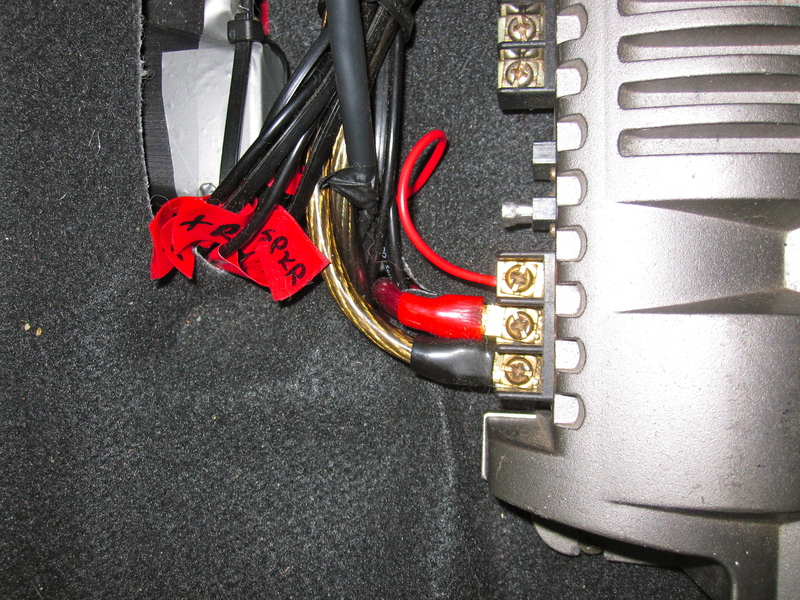 In this case, the harness is above the key that shows which wire is which and the amp is bolted to the floor. Therefore I thought it would be easier to rewrite the legend to ensure I have the right wires connecting. I’ve used an old cardboard box and made sure I could check off which ones I’ve done. Next step is to get everything ready for joining. Firstly, cut up some heat shrink and put that on one side of the wires. Next, strip the ends of all the wires (there should be eight). From there you can check which ones connect and then twist, solder and heat shrink them. Below is a progress shot and the finished product. Note the cable ties to keep everything nicely in place. It’s been a while since I’ve done any more work on the stereo in the Getz. However, almost done. I really wanted to get it finished this time, but time, as always, is my enemy. I did however get a few other bits finished off and only have pretty much two things to do left – hook up the speakers to the amp and turn it on. 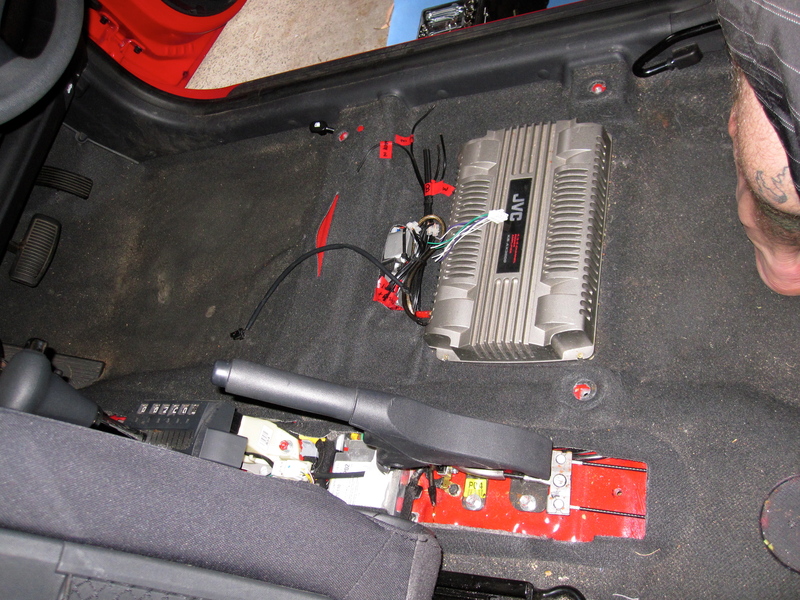 I did however have a couple of things that I did need to finalise before I do that: Connecting the ground, connecting the remote wire, connect the sub wiring to the amp and too the sub. Okay, so as you can see, centre console is off and the chair is out and I’m ready to start work. To connect the ground, I have decided to use the existing ground bolt for other equipment. I could find somewhere better and drill or stuff, but I think this should be fine. If I find there is a lot of interference then I may need to look at positioning it somewhere else, but this spot should be okay. 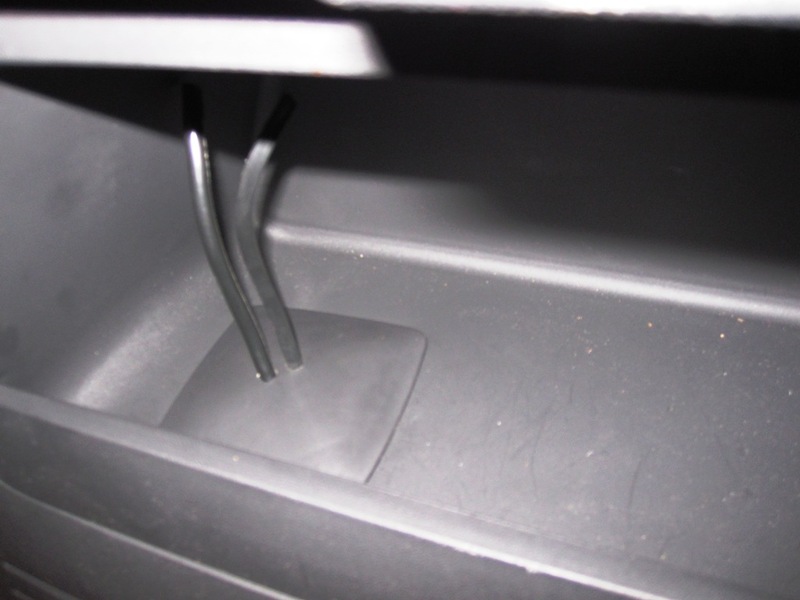 The spot is under the handbrake, here’s a close up. 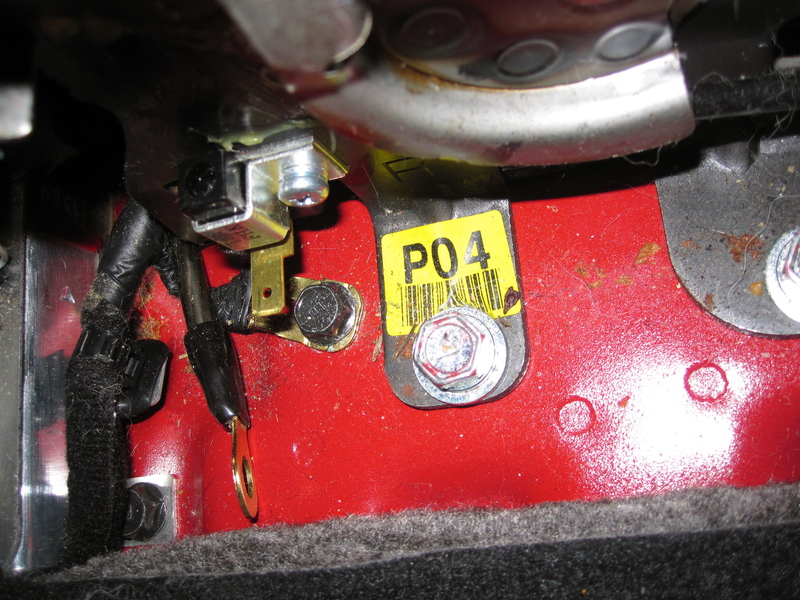 You can see the ground wire from the amp just sitting there – that needs to go on the bolt next to the P04 labelled bolt. It’s a little hard to get to, so I removed the switch that holds the wire sending the message to turn on the hand brake light. It’s unplugged in this picture, but is directly above the bolt I want to use. There’s just a small screw holding it in – remove and don’t lose. 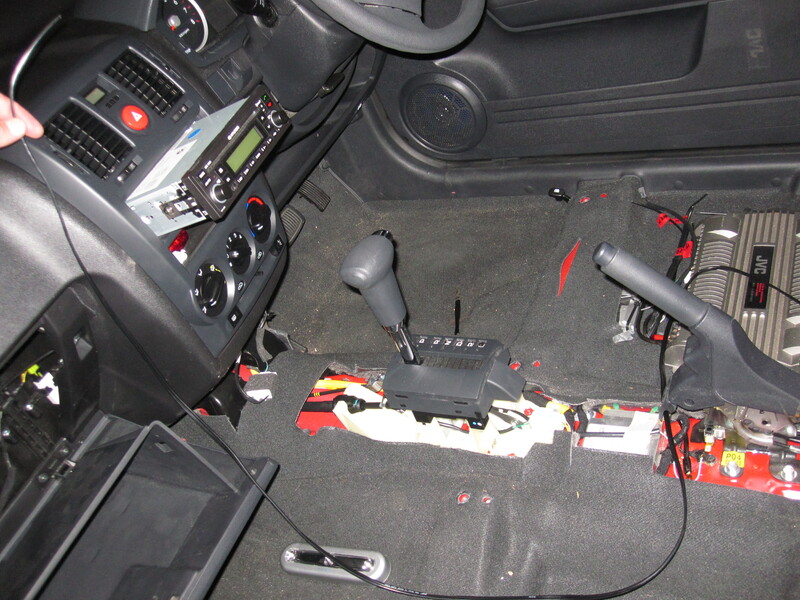 The photo above shows said screw and switch from the handbrake removed. 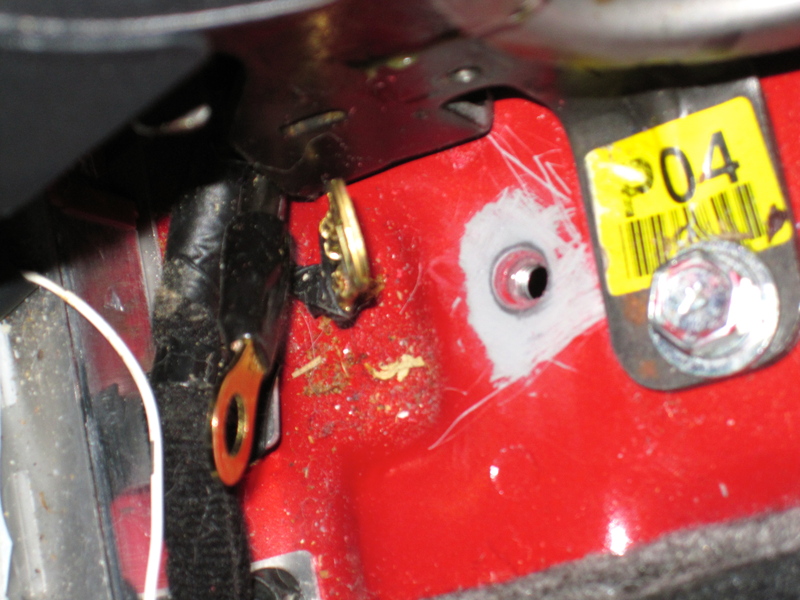 The biggest thing you should notice here is that there is a lot of paint around the hole where the grounding bolt goes. This presents a problem as the paint interferes with how solid the grounding will be. Therefore, we need to make a nice bit section around the bolt hole that has no paint. Next I want to put the ring of the amp ground onto the same bolt as what’s already there so I’ve put some washers in to space them out a little. I prefer to put a nut in there, but I didn’t have any that fit, so the washer will do fine. 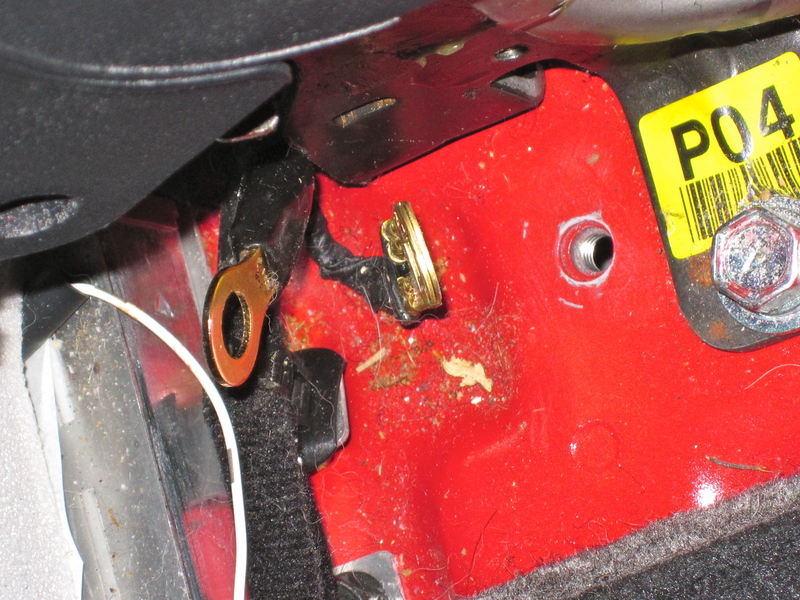 What you see in the photo above is (from top down) bolt, washer, smaller washer, amp ring, washer, existing ground then all of that is attached to the body of the car. That should do it. The remote wire makes sure that the amp is turned on only when the stereo is turned on. 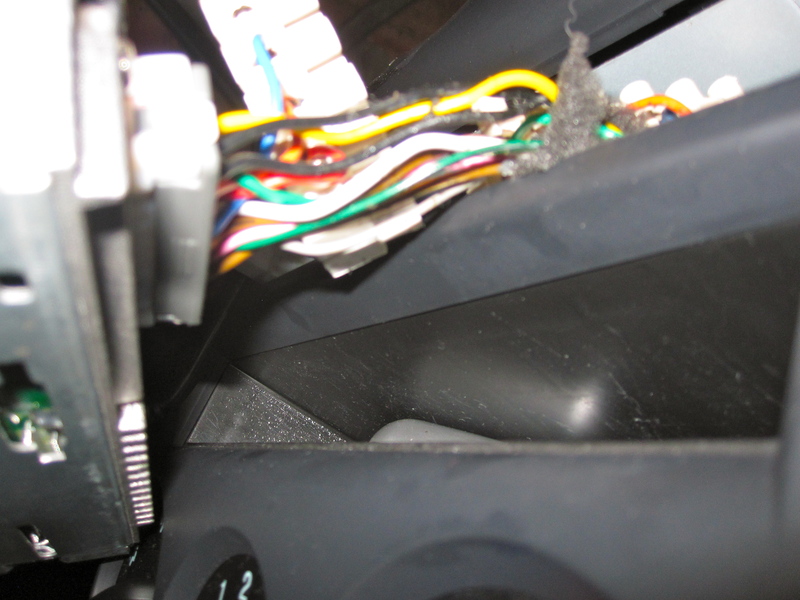 I couldn’t find an actual remote wire, but I did find the accessories wire on the back of the factory stereo. This is just as good. 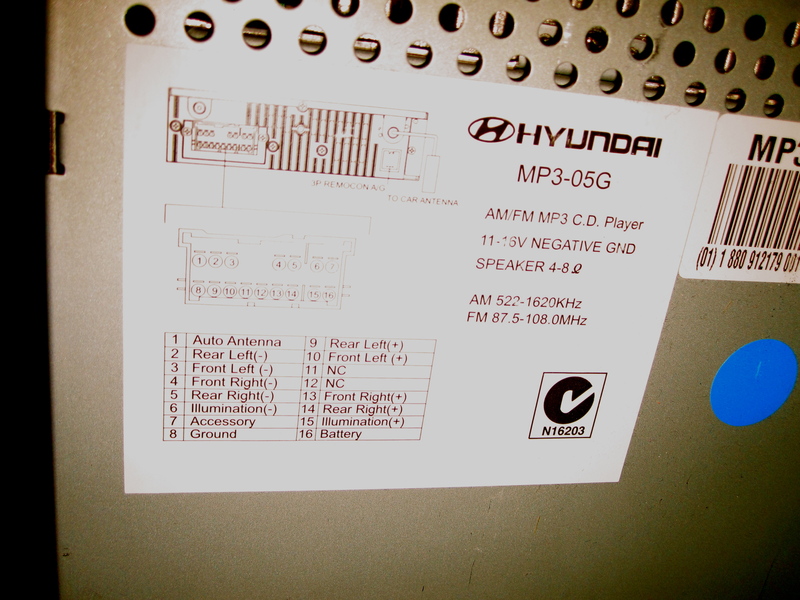 It means that the amp will only turn on when the key is in the car and turned to either “Accessories” or start. This means the amp won’t drain the battery while just sitting there. Basically, what I need to do is to run a wire from the accessories wire to the amp. This means splitting the current wire and then joining in another wire to go to the amp. Since it’s really tight in there, I’ve decided to split the wire, extend it and then join it to the amp wire. First step (as always) is to prepare. And finally, check this all works by turning the key to accessories. If the stereo still works, at least you have the connection closed again. Once the amp is connected, we’ll see if it works then. Alright, now for the latest instalment. Firstly, I need to precursor this post by saying that I had very limited time to do this. Knowing that in advance is a good thing. The reason I mention it is that there are a few steps in here that wouldn’t need to be done, but I have because it means that I could pack everything up and return the car if I had to. 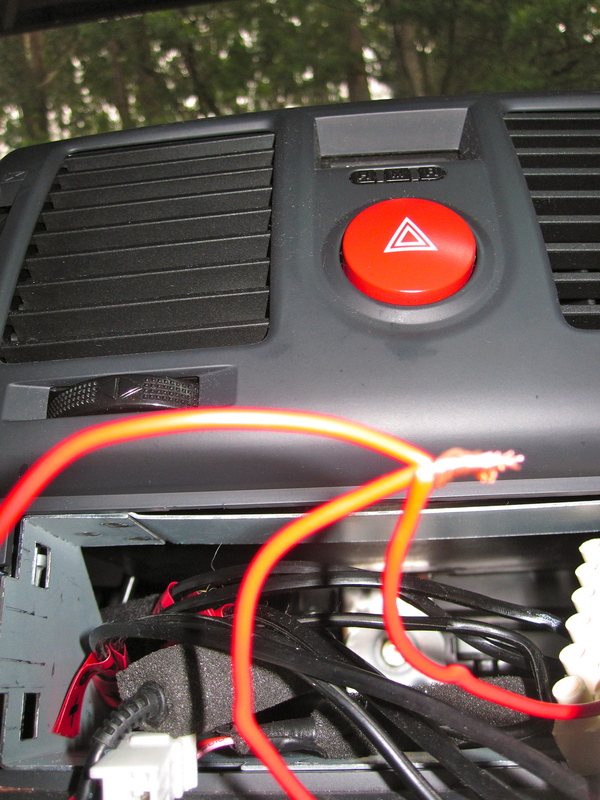 The car currently has a wire that goes from the stereo to the speaker. I need to put a new wire from the stereo to the amp. Then I need to put a new wire from the amp to the speaker. 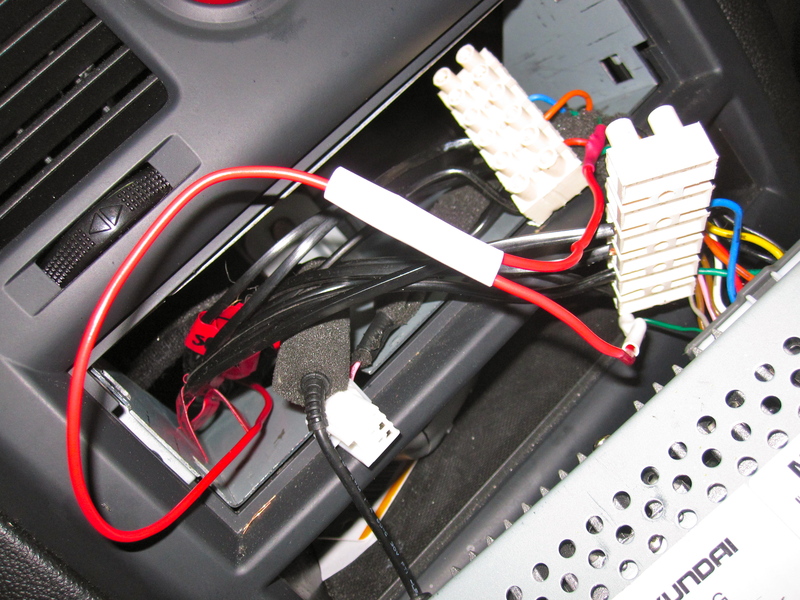 However, if you think about it, I don’t really need to rewire the whole car. 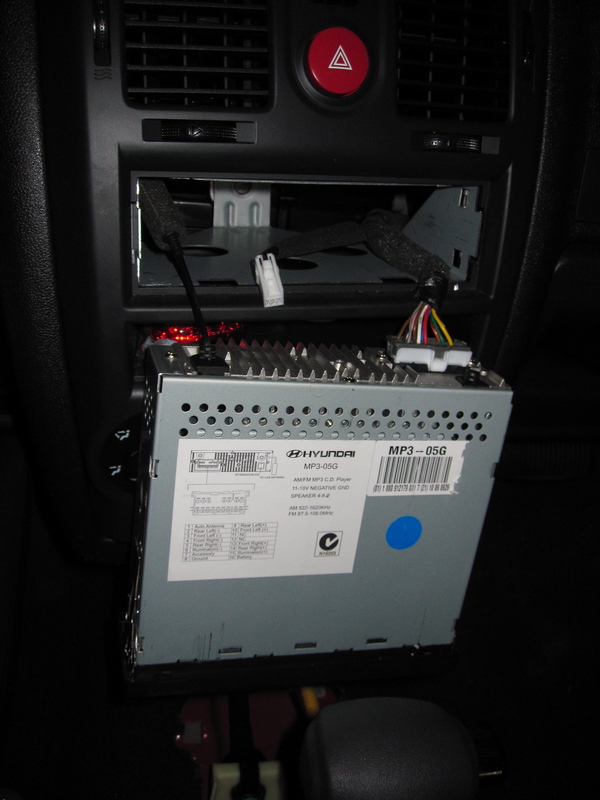 I can just tap into the wire going from the head unit to the speaker! 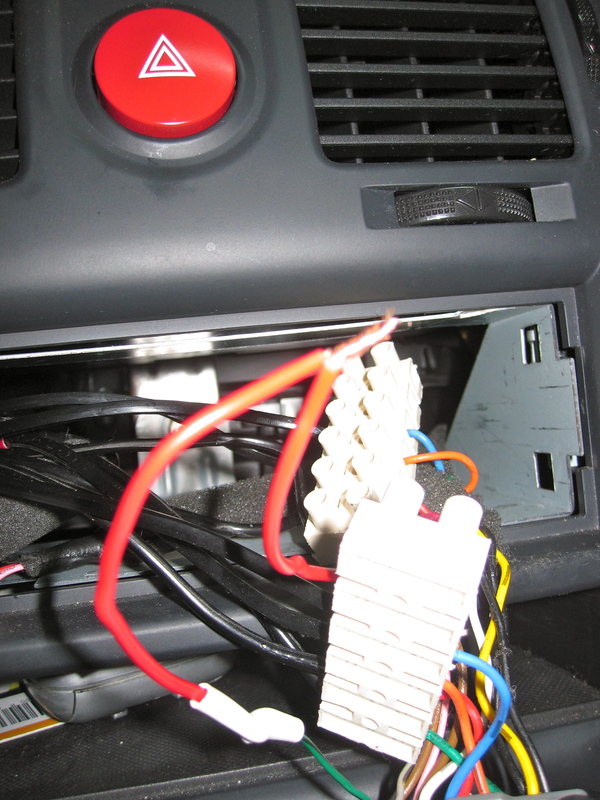 With that in mind, the idea of this post is to show how I’ve inserted two wires (per speaker) into the head unit area to by tap into the existing wiring. 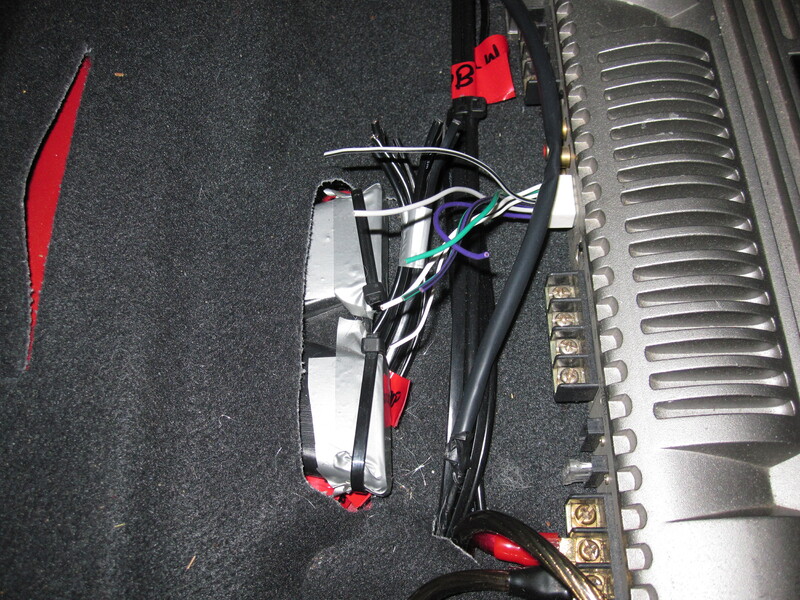 I will also make sure that it works (and be able to return the car on time with a working stereo) by temporarily connecting the two wires at the amp – that is the stereo to amp wire and the amp to speaker wire. Essentially I’m just lengthening the cables. The first thing I had to do was pull out the headunit. To make this and future steps for this section easier, I also pulled out the chairs and centre console, which I can do in about 30 seconds now. See previous posts for instructions. Remove all stuff from the glovebox. All of it. Otherwise, when you do the next couple of steps, anything left inside will be unceremoniously dumped on the floor. 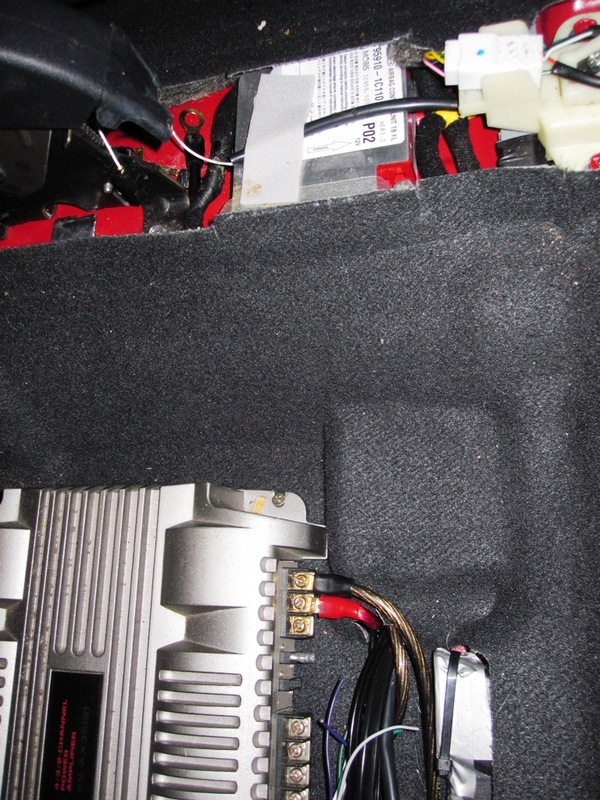 With the glovebox open, find the rubber stoppers on the left and right hand sides that keep the glovebox from falling open. Gently pull the plastic square away from the wall of the glovebox and at the same time, push the rubber stopper from the other side. Rotate the plastic part a little as you go and you’ll find that it will come out pretty easily. Once both stoppers are removed the glovebox hangs nicely down out of the way, exposing a hole where you can stick you hand in to get to the stereo. Now, for the next part you want to have really small hands – if you don’t prepare to get cuts and scrapes on your hands and arm. 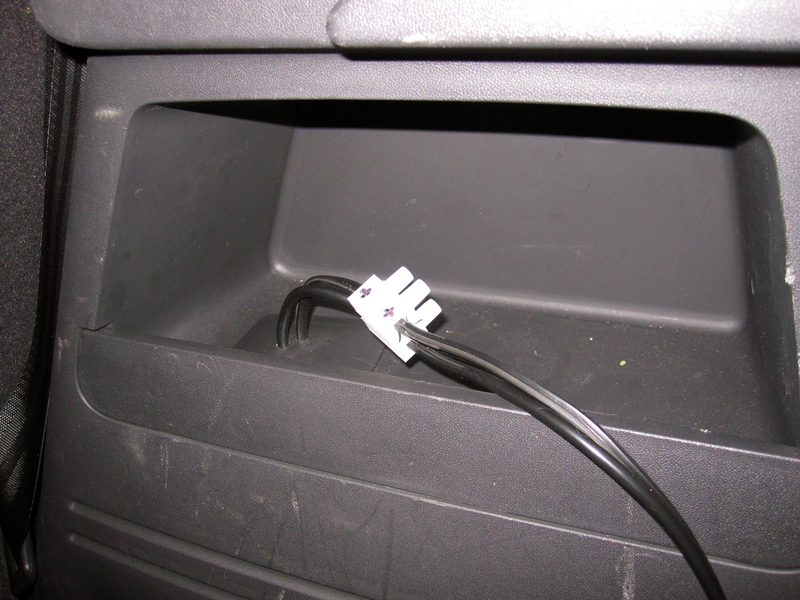 Stick you’re hand in the gap and locate the back of the head unit by feel. Gently push on it and see if it will come out. Also feel for the connectors that go into the back of the head unit. 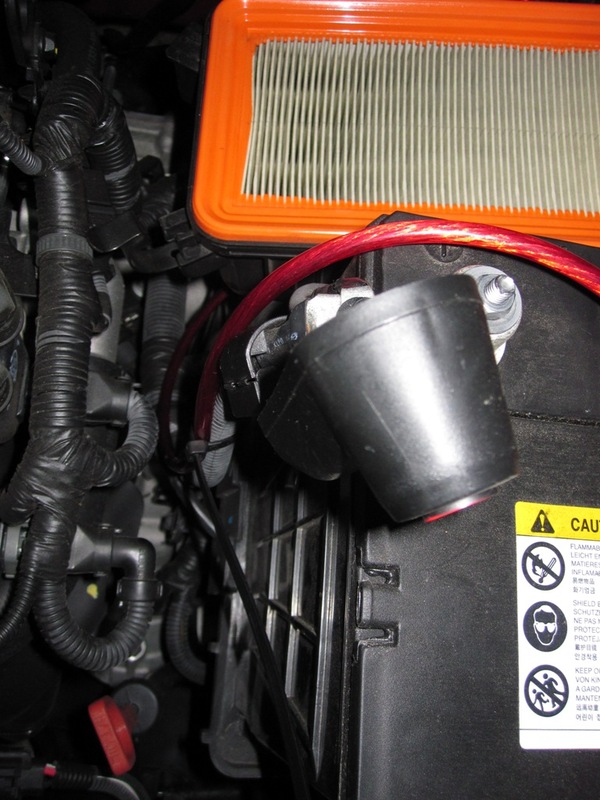 There are two little metal clips on either side of the unit, not very big, but they are supposed to hold the head unit in. With something large and flat (eg butter knife or metal ruler or something) gently slip it down the side of the head unit from the outside, while pushing from the back of the unit. What you’re trying to do is disengage the clips on the side. It’s not too difficult, just be careful not to scratch anything on the outside. Once these clips come undone, you’ll find the unit will only push so far. You will need to disconnect one of the clips at the back of the unit for it to actually come out. When it does, just let it hang there. 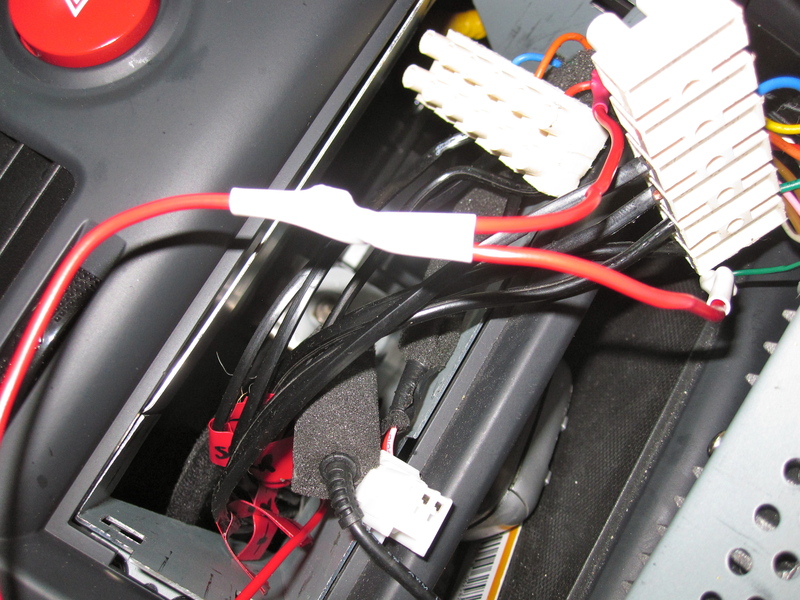 Below is a close(r) up photo of the panel on the top of the head unit. This is a good one because it gives you the information about which wire goes where. We’ll need to know that when we connect the wires. So, speaking of wires, it’s time to put the wires through. First task – cut the wire. I said that there needs to be a wire from the stereo to the amp and then from the amp to the speaker for each speaker. This means 4 sets of wiring (8 if you count the positive and the negative separately). 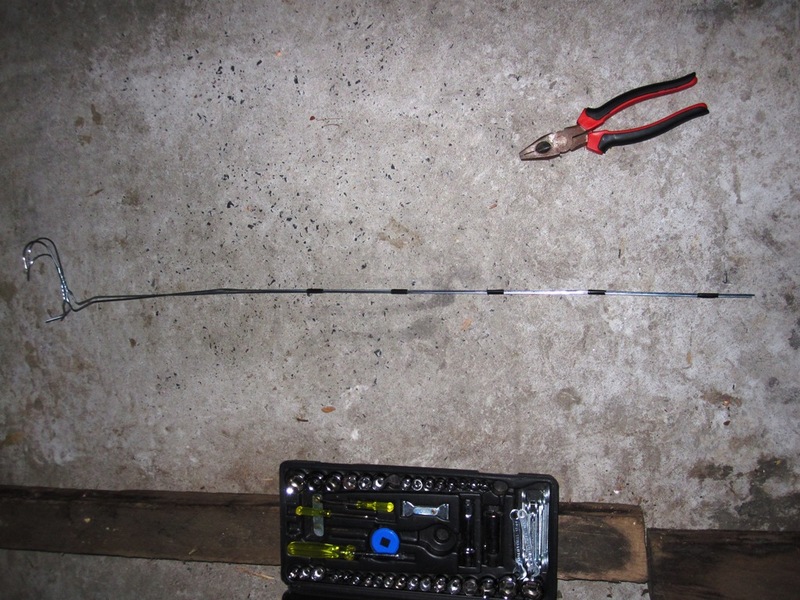 To measure how long each wire should be, get one length right first and then cut the others to the same size. 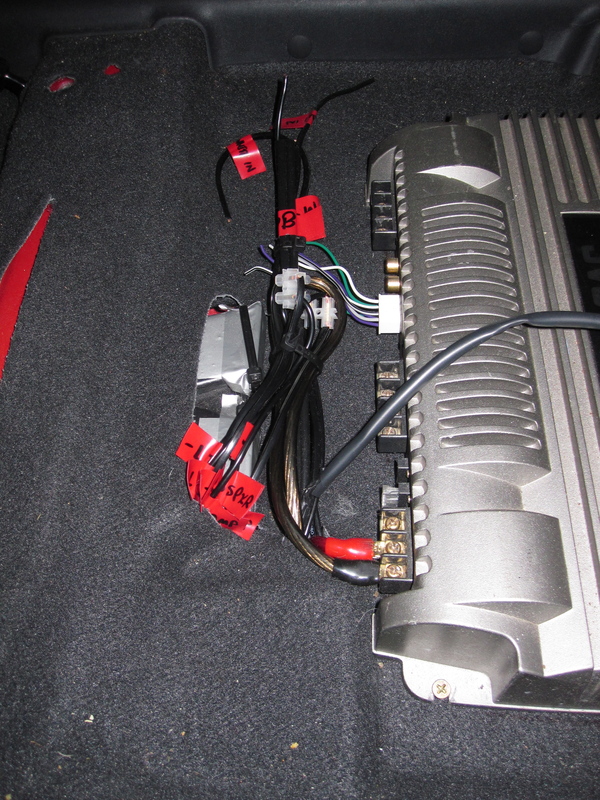 We can o this by running the wire from the head unit (on the outside is fine) to the amp. Make sure it’s really slack so it accounts for bends and such. Remember, longer is always better – you can cut it shorter, but you can’t cut it longer. Two things first on best practice. Number 1 – the squarish wire should be positive and the roundish wire should be negative. If they are the same it doesn’t matter, but if that’s the case (and even if it isn’t), Number 2 – label all your wires. 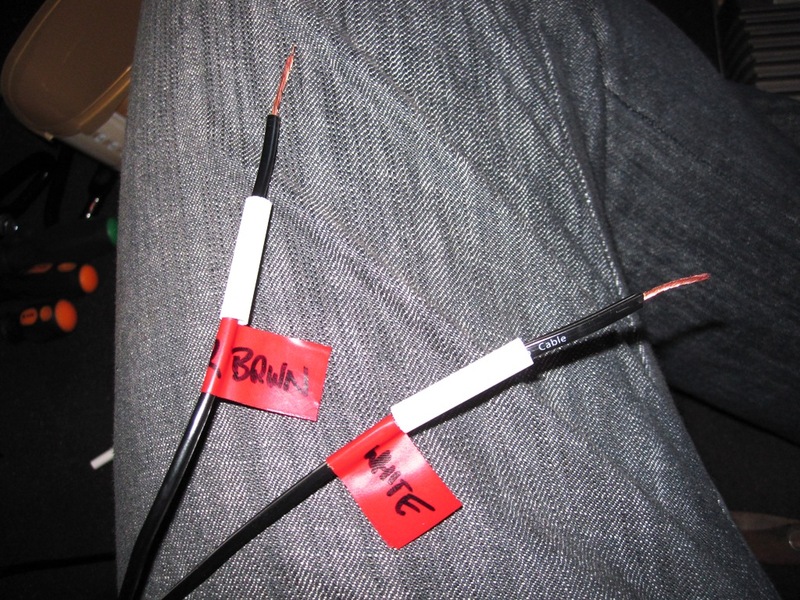 A bit of electrical tape wrapped around the end of the wire is fine for labelling and avoids mistakes and uncertainty. The way I found easy to do this is to put the strips of tape on your jeans leg and then write on the with a sharpie (permanent marker). The abbreviations I’ve used should be pretty straight forward…. plus or minus for positive (+) and negative (-), L or R for left and right (speakers) and then from the head unit to the amp (to amp) and from the amp to the speaker (to spkr). To make sure I put these on the right wires, I laid them out on the roof to see them all at once and then went through and labelled them. This way it’s pretty easy to make sure that the positive on one end is the positive on the other end. You’ll need to do two sets of labels from what you saw of my leg above – one for each end of the wire. Once you’ve done that (and I know it takes ages, but it will help down the track, trust me), we need to put all these wires in the same place, so we can tie them all together. I found that a bit of pvc tape wrapped around them at intervals is enough. Next we need to connect the wires up. So, I keep going on about this, but the flow is headunit – amp – speakers. I’m going to take the amp bit out of it so I can test that everything works okay. 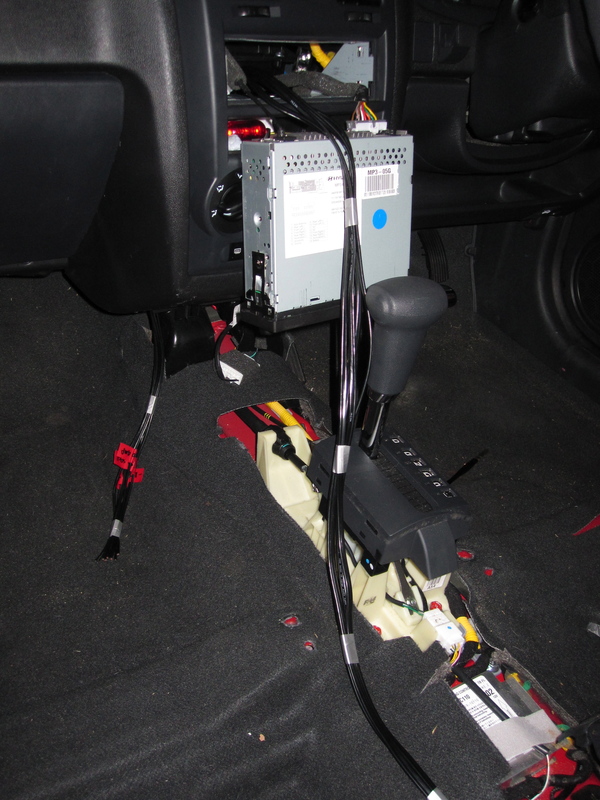 I’ve also run out of time and need to put the car back together so this will hold in the short term, allowing the owner to use the system. 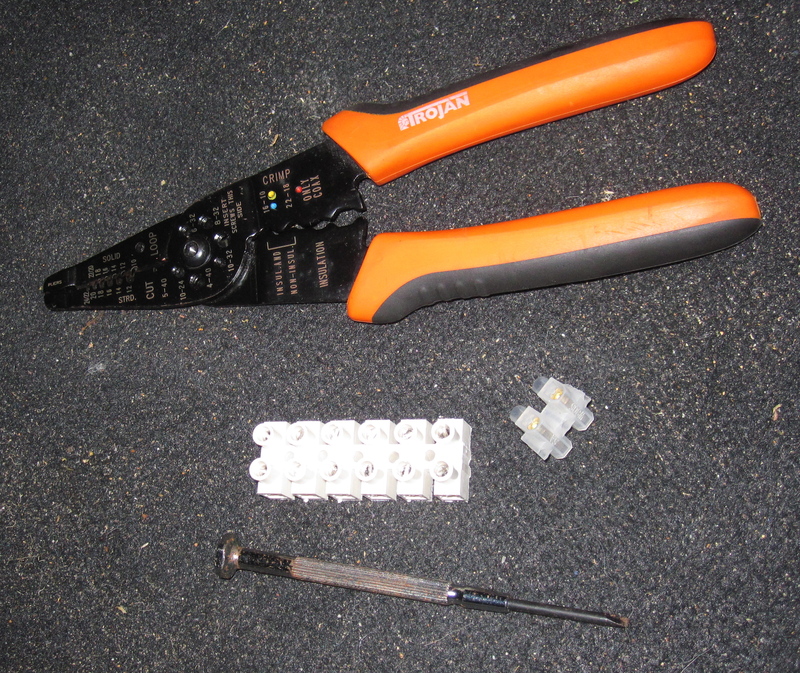 You probably know the wire strippers and screwdriver, but the lego block looking thing is a wire connector. The idea is that the two wires are inserted into either side and then secured with a screw. Not the best way to connect them, but a good temporary way. I’ll be using these to connect all the wires at this stage so that I can make sure everything is working properly and then I can replace the connectors with twist, solder and heatshrink. 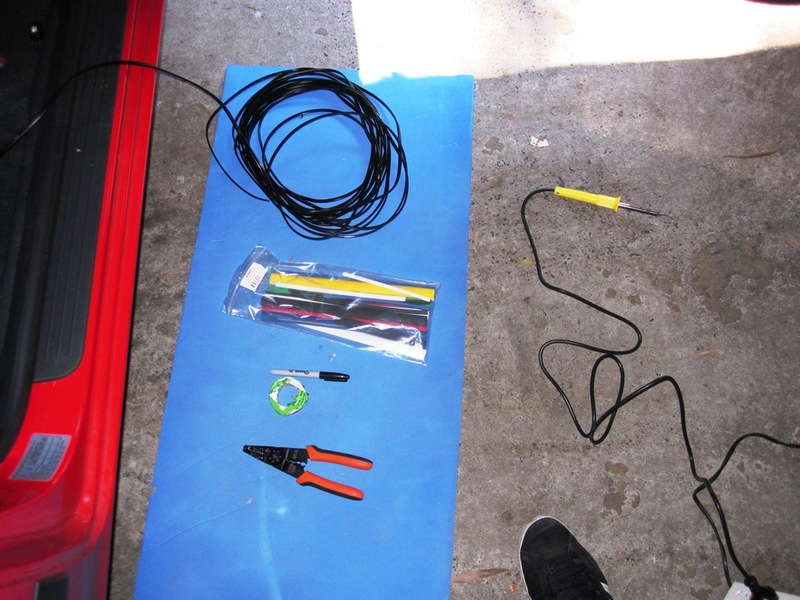 First, at the amp, use the wire strippers to… unh… strip the wires. Then we want to find the Left Positive wires – there should be two – one to the amp and one to the amp and one to the speakers. We want to connect those two together. Above you can see (well, in a blurry way) where I’ve connected both the positive to positive and negative to negative on the left speaker. Do the same for the right speaker as well. Then once that’s done, let’s go to the head unit. 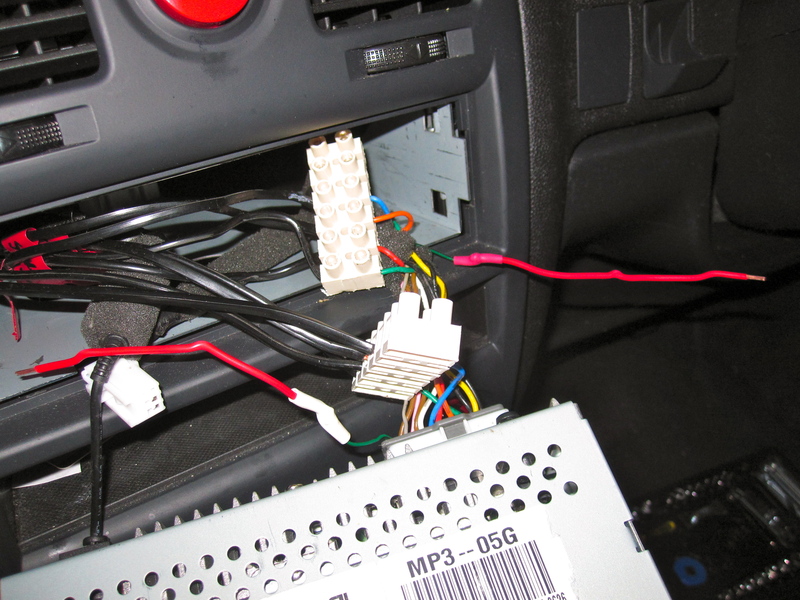 At the headunit, find the coloured wire that corresponds with the wire we’re inserting. Ideally we’re splicing the wires into where the current wire is. 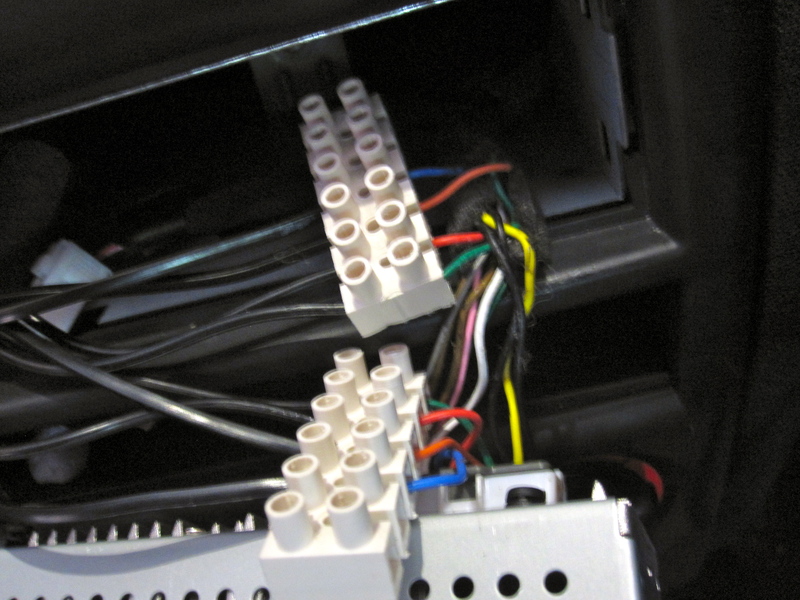 Therefore, cut the wire, strip it and the connect one end (at the headunit) labelled “to amp” and the connect the other end of the coloured wire to the wire labelled “to spkr”. this basically brings the amp into the loop, uses existing wiring and should be great for us to test it’s all good. Use the diagram I had a picture up of earlier explaining what each colour is so you don’t get them mixed up. Check and double check as many times as you need to because it will be a pain to find out which one isn’t working if you have problems. Last step is to tidy up all the wires so nothing gets accidentally pulled out. Then cable tie them and test. Did it work? Awesome. We can put the car back together and next time connect power to the amp!! If it didn’t work, go through and check each of the wires and ensure they are all connected properly and that the right wires went to the right places. Right. Now that we have a way through the firewall, we really need some sort of tool that will help get the power cable through. There is one – it’s called a grabber. You push it through and “grab” the cable and then pull it back through the hole. I don’t have one. Neither do most people. So I made my own. 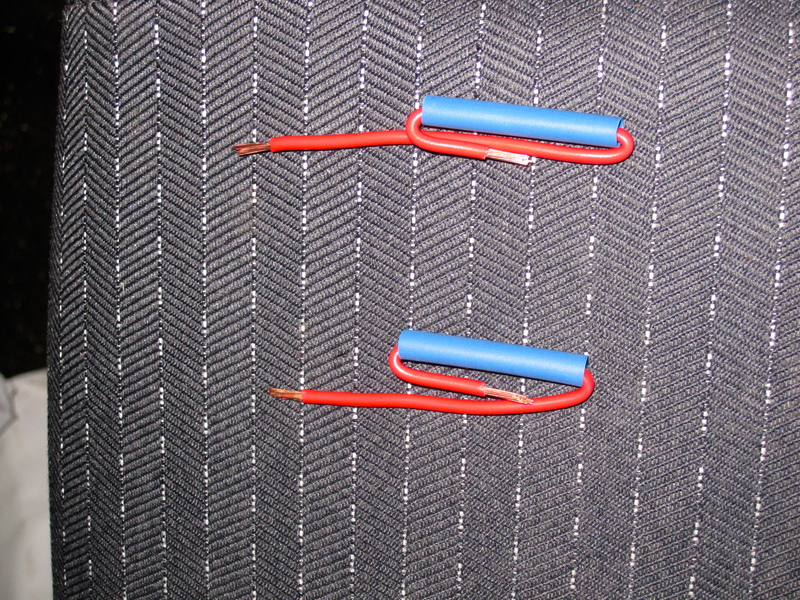 Three coat hangers cut and then straightened out with pliers, then taped together. Hey, it’ll work. Now, the theory is that you stick the coat hanger tool into the grommet the same way that you did the screw driver (same angle and everything), and in theory, it should come out the same. Once the coat hanger tool sticks through into the cabin, it’s a matter of undoing the end piece of tape, sticking the cable in there with the three tines surrounding the cable, tape it all up and pull it back through – gently. So, as you can see in the above picture, the sticking through bit went okay. Again the key is to be gentle but firm. 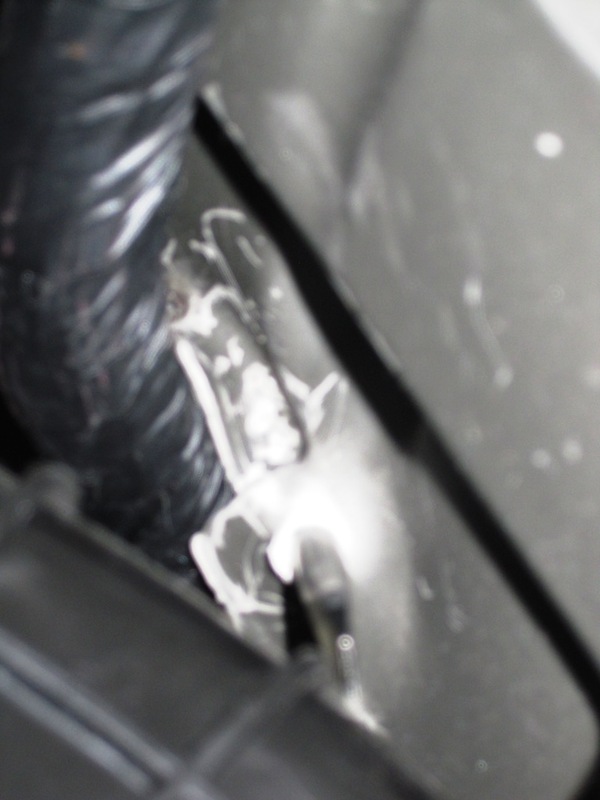 In the photo you can also see how I’d coaxed some of the grommet out of the housing. We’ll put that back later when the cable is in there. Excitedly running around to the cabin, I saw that it had indeed made it through. That’s exciting stuff right there. Now that it’s through, all we need to do is attach the cable as I described. And there it is, all nicely taped up and ready for the journey. If you have two people available, it’s a good idea to have one person pushing/guiding and the other pulling the cable through. It was only me, so I just had to be careful. Success!! You can see the cable poking out of the grommet now! Joy and happiness ensued! This means we have the cable through – the hard part is done, but there is still work to do. Cut the tip off the power cord (close to the coat hanger wire as possible) to release my marvelous coat hanger machine. Pull through as much cable as you think you would need and then try to push the grommet back into place as much as you can. 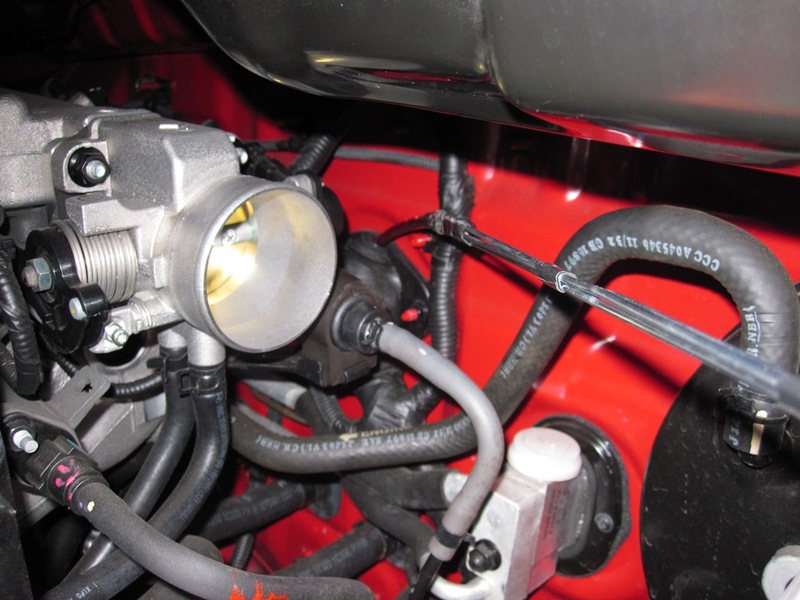 You’ll need to next run the cable around the engine bay to get it to the battery. This is the path I chose (above) and it seems to work okay. The golden rule here is to keep it tidy. Tidy means cable ties. 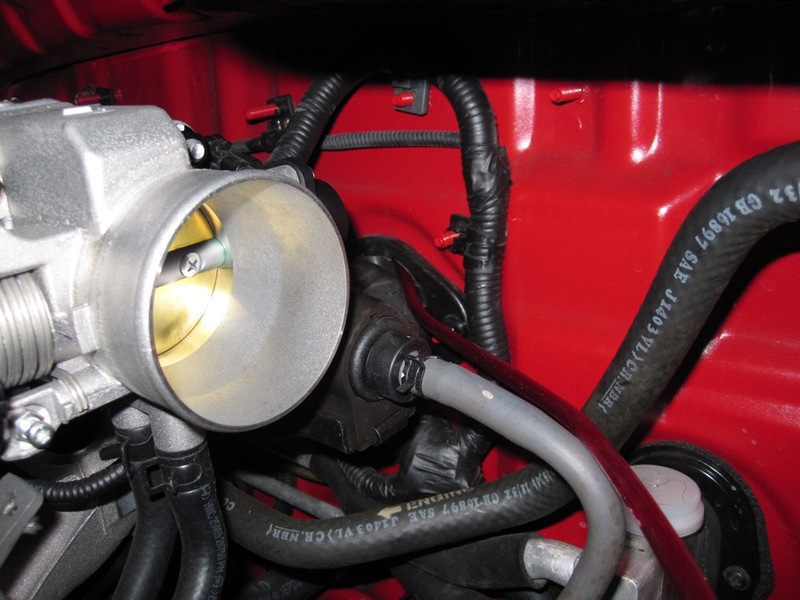 Tidy means not burning on the engine. Tidy means not in the way of other machinery. Once you’ve established the path cable tie it in place so you don’t lose it. Now, I haven’t yet spoken about fuses. 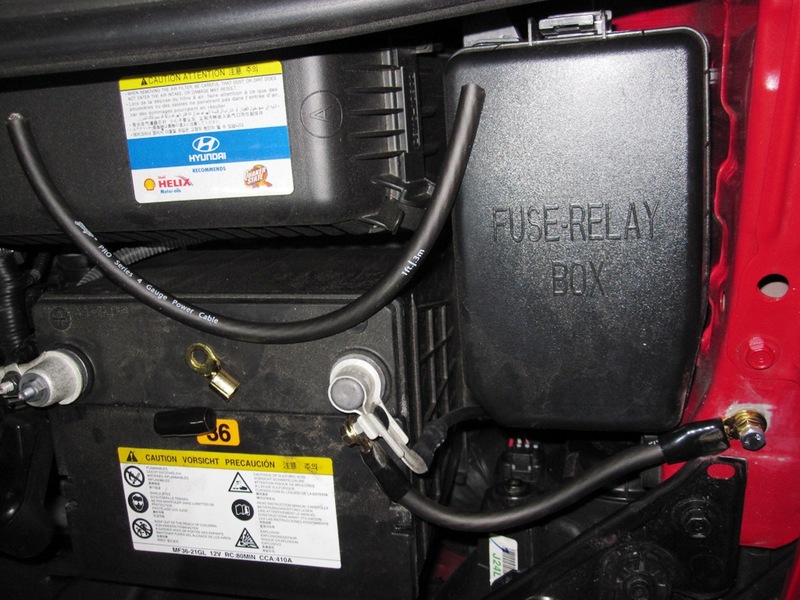 All electrical devices in you car should have a fuse in place. The idea is that if there is a power surge, the fuse takes one for the team. 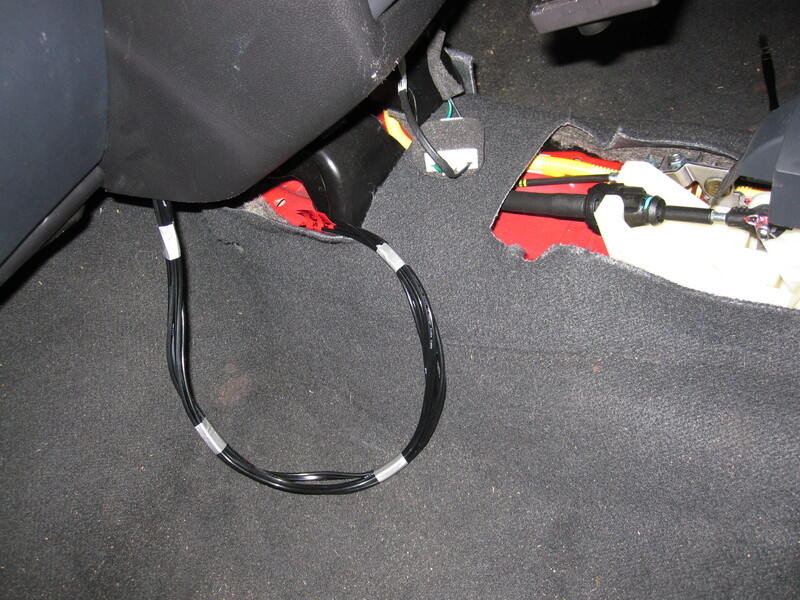 However, if your car gets hit and the power cord gets severed, well… let’s just say it would be shocking. The fuse in that instance trips and your life is saved. 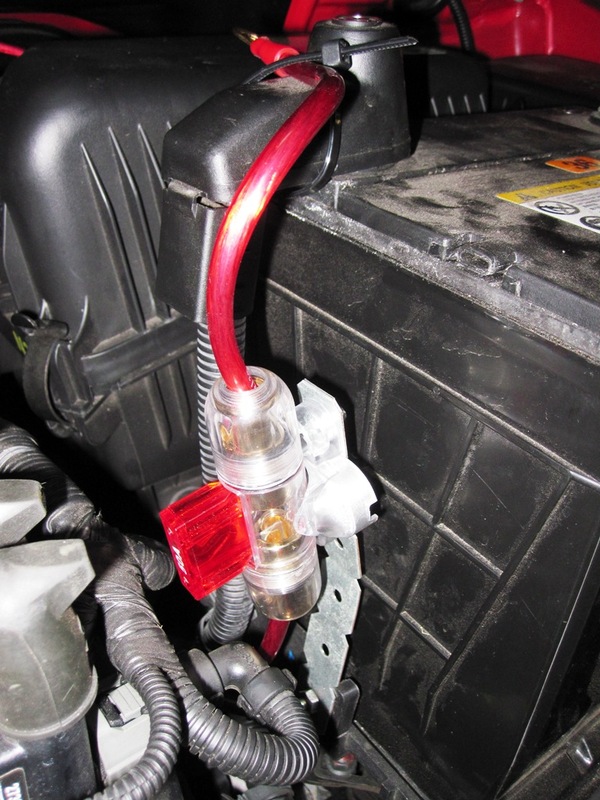 Because of the last reason, “they” recommend that the fuse is within 30 cm of the connection to the battery. The closer the better, though. This is a fuse holder stand that I kinda threw together very quickly. It’s a bit of scrap metal that is screwed near the battery. You may want to be more imaginative, but this is fine. 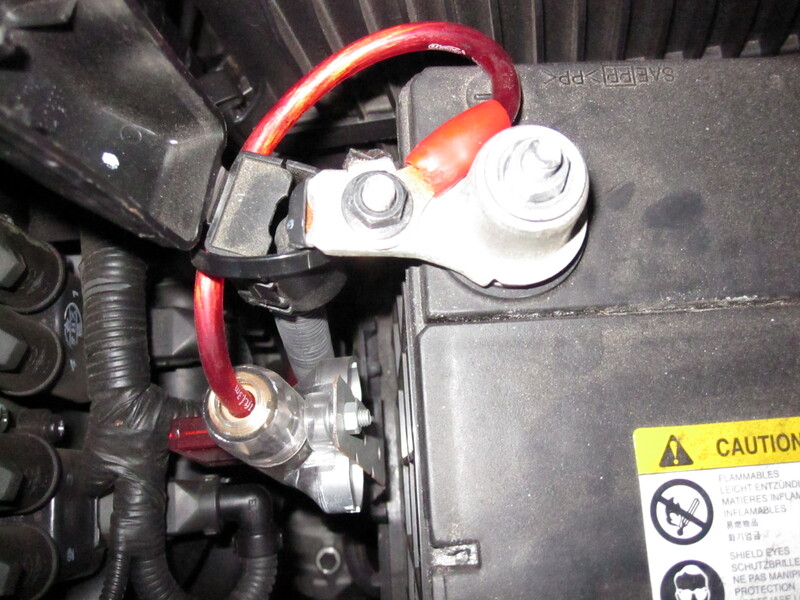 Make sure you get the right holder and fuse that is right for the power going through your car. But, MOUNT the fuse holder – don’t just cable it somewhere to hang. This is how it all looks when in place. Notice I haven’t connected to the power as yet, that will be the very last thing I do. But this has all worked out nicely and is now sitting in the engine bay. Okay, the above photo shows where I’m up to right now. The power is connected (red wire), black is the grounding. They are both connected to the amp, but not the battery – I’m just getting it ready. Also I haven’t yet done the ground from the amp. It will connect under the handbrake, and you can just see it at the top of photo above. Okay, this is the hardest part of the whole project so far and very necessary. For an amp to work, it needs power. 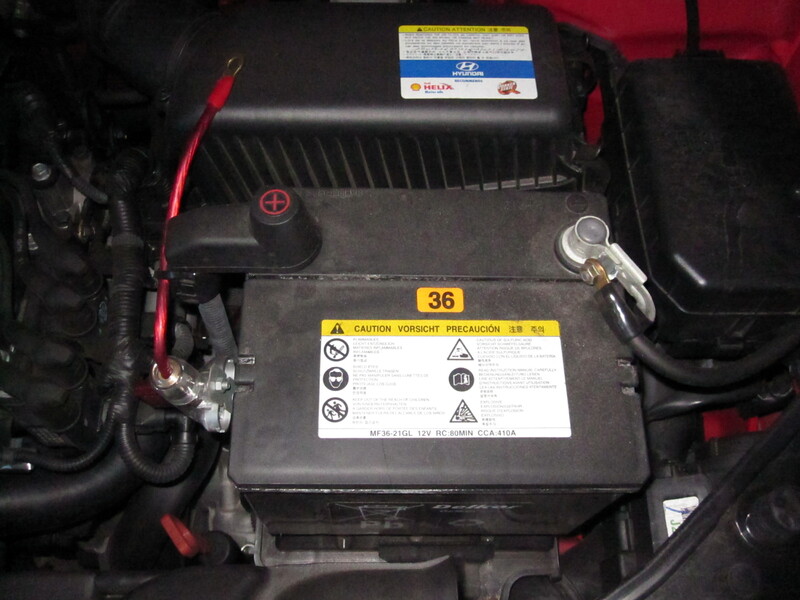 Power comes from the battery of the car. 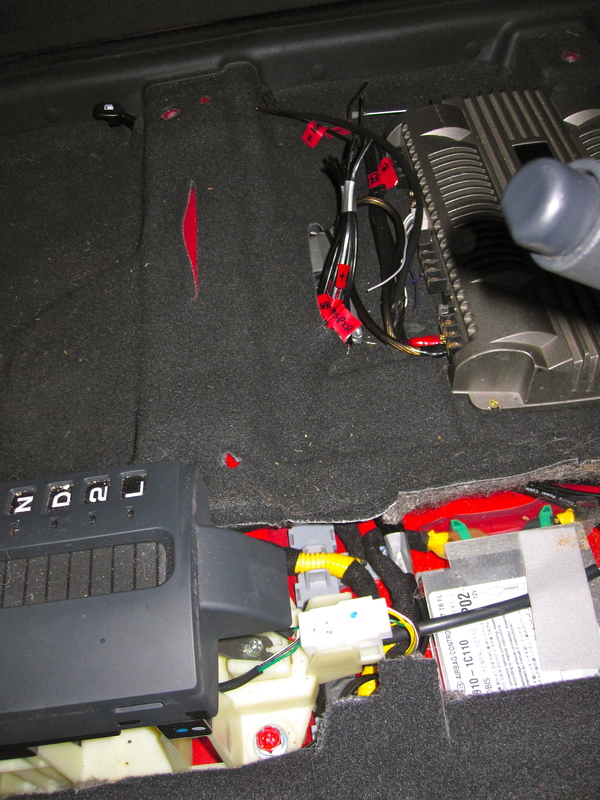 The battery sits in the engine bay, which is outside of the interior of the car where all the stereo equipment is. 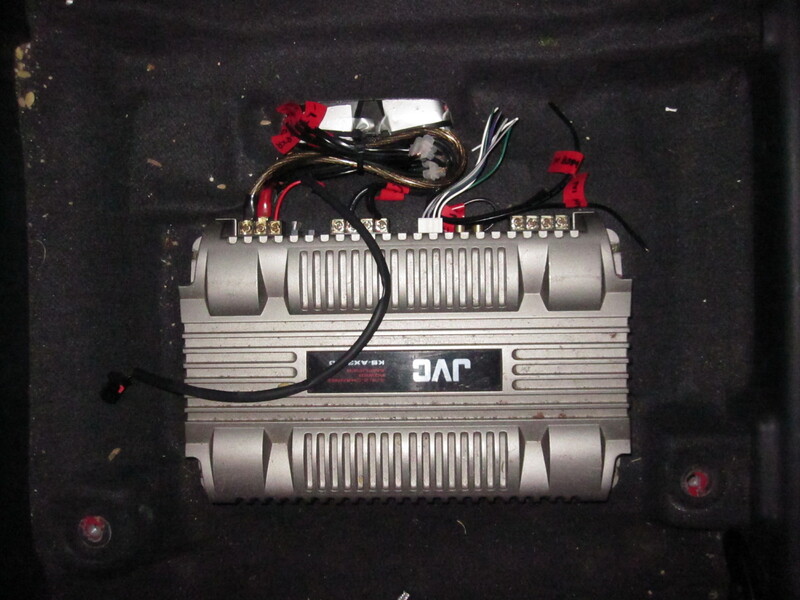 Therefore, I need to run a power cable from the battery to the inside of the car where the amp is. I’ve done some research and got some weird answers, but after really putting my mind to it I have worked out a way! And I’m going to share it with you. Before I get in to the power, something needs to be said. Your battery has a positive and negative terminal. The power cable itself is connected to the positive terminal, the negative just grounds the electricity. The ground is as important as the power. Otherwise terrible things happen. Firstly, I have increased the amount of grounding from the battery since I have increased the amount of power I’m taking from it. So on the right hand side you can see the extra ground I have connected. On the left, you can see the wire I’ve used, the connector and the sleeve. All you need is the wire, and two of these connectors and you can make a ground. 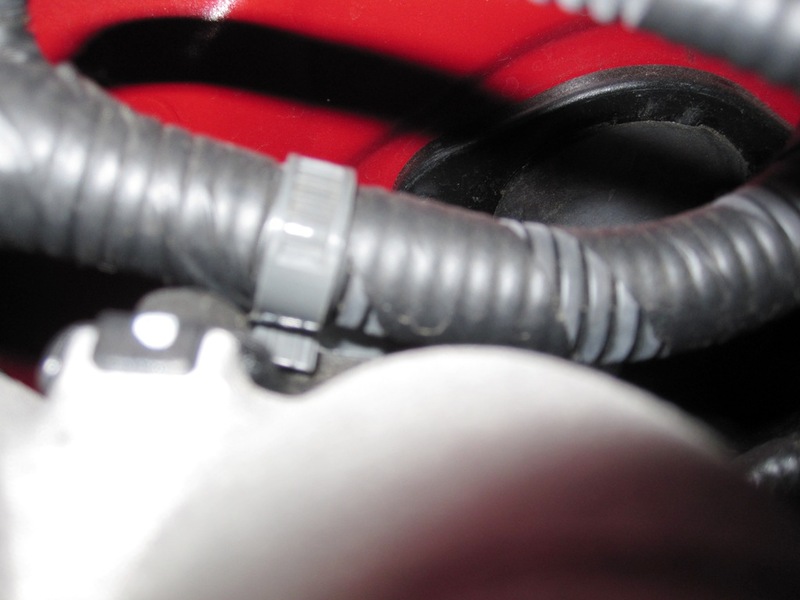 However, remember that for the ground to work properly, you need to make sure that the grounding point (under the screw and connector) is bare metal. Scrape it back with wet and dry sandpaper, or a dremel if you have one. 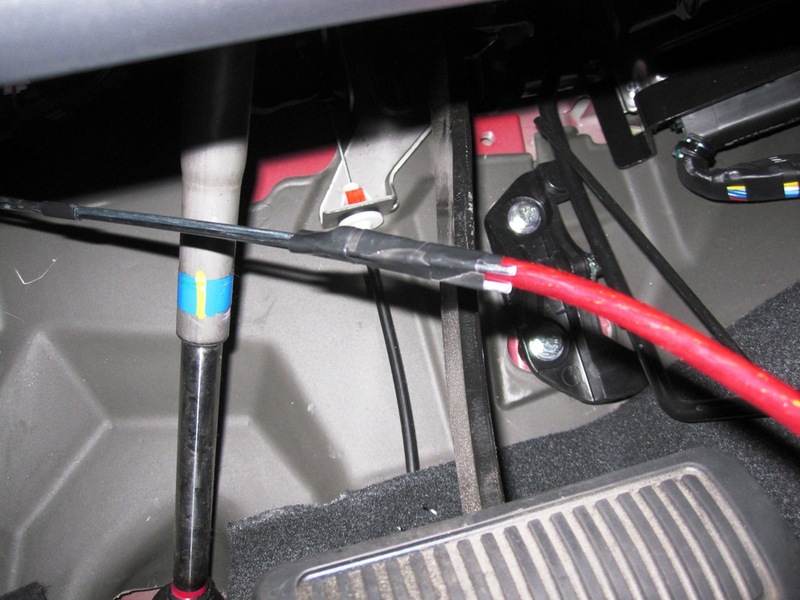 Also, you can go the next step and put another cable like the one I put there from that bolt to another on the body. It really does help and you should always do this stuff properly. Okay, on to the power. A sneaky little grommet leading through the firewall into the cabin! Sure, it’s hard to get to and jam packed with wires, but it’s an in that I can use! However, getting to it is going to be a problem. I know! I’ll pull the engine apart! Okay, it’s not that drastic, but looking at it, if we move that air box and pipe out of the way, I reckon I have a good shot at it. Okay, to remove the top of the box, there are four clips (you can see the two on the right hand side in the photo above). 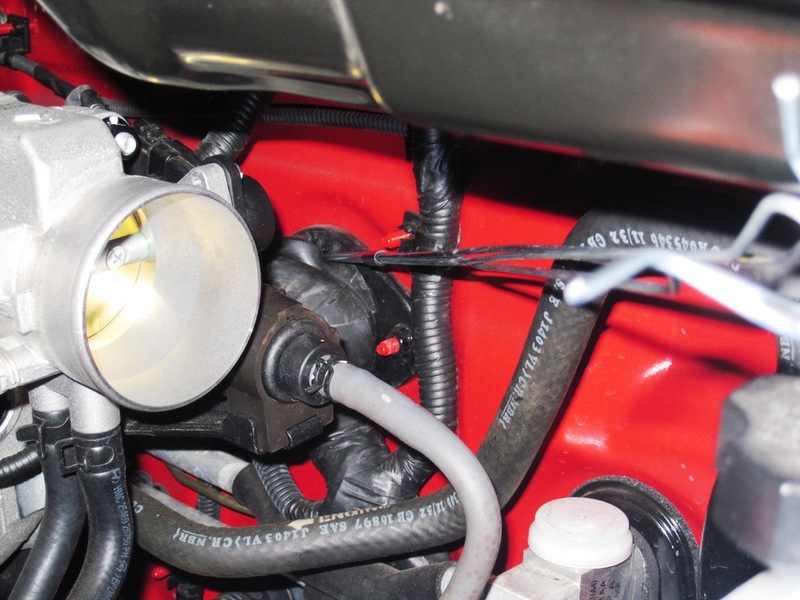 One of the clips is upside down under the hose going to the engine. WARNING!! 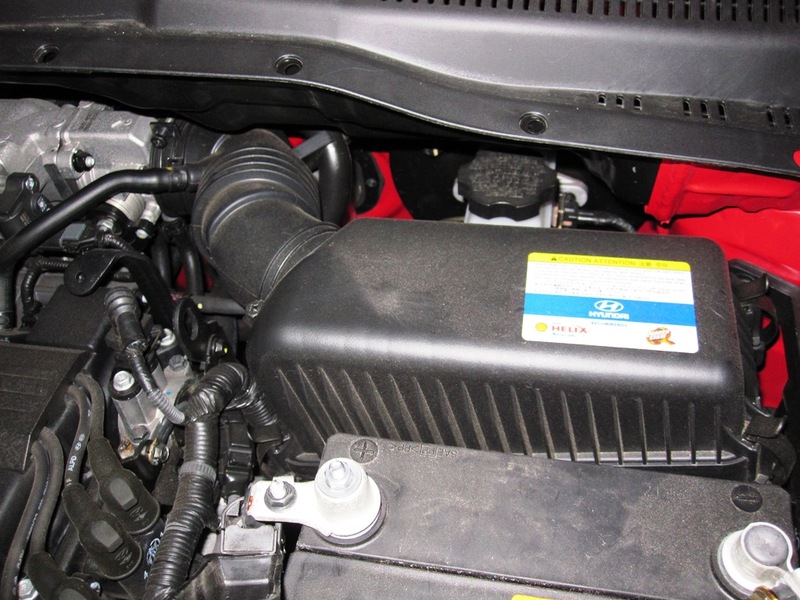 The top part of the air box is where the air goes to the engine. 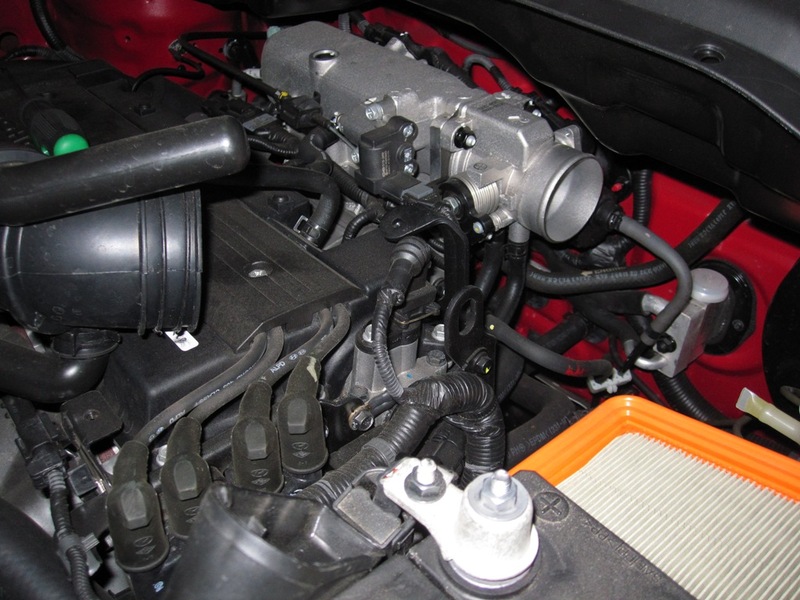 That filter on the right stops dirt and dust getting into the engine. 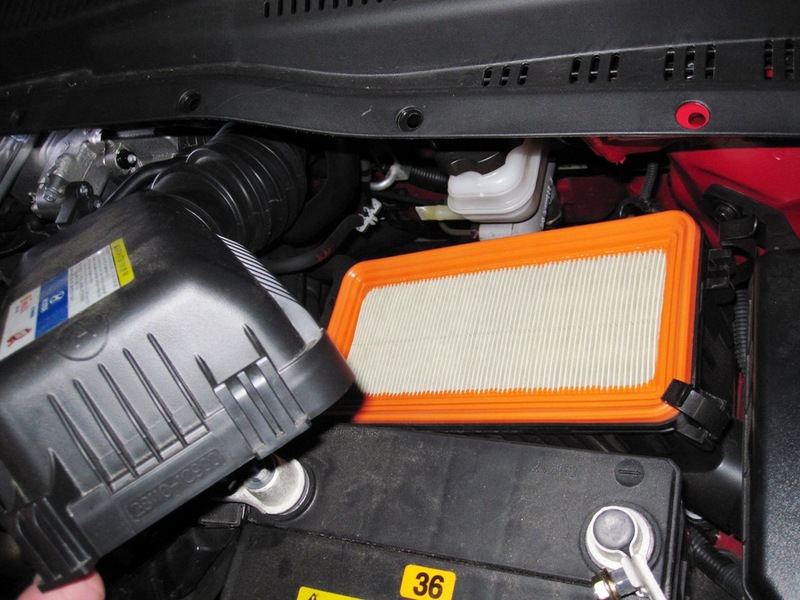 If you get dirt or dust on the exposed side of the air filter (that you can see in the photo), it will get sucked into the engine. And that is bad. Just be mindful of that. To remove the hose is pretty easy. 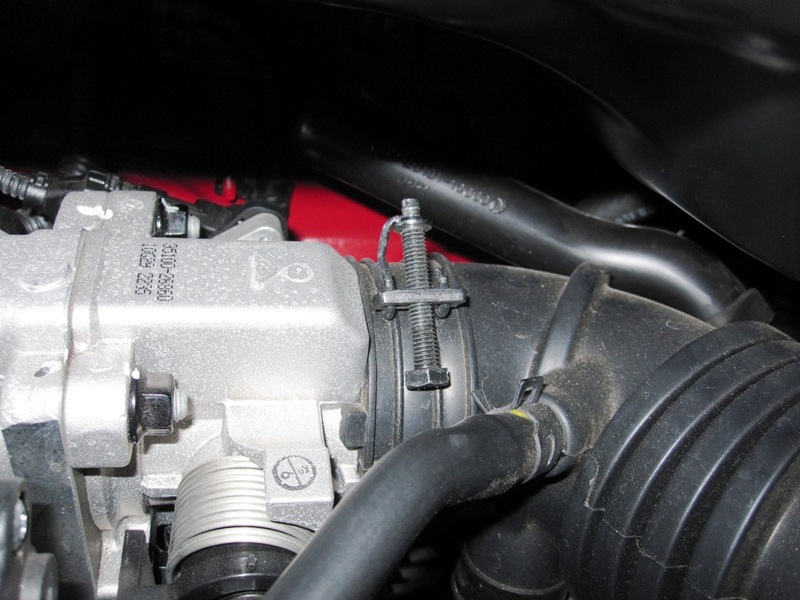 There is a hose clamp that is tightened with a screw. Unscrew the screw like you can see in the photo above and then the hose will pop right off when you pull it. 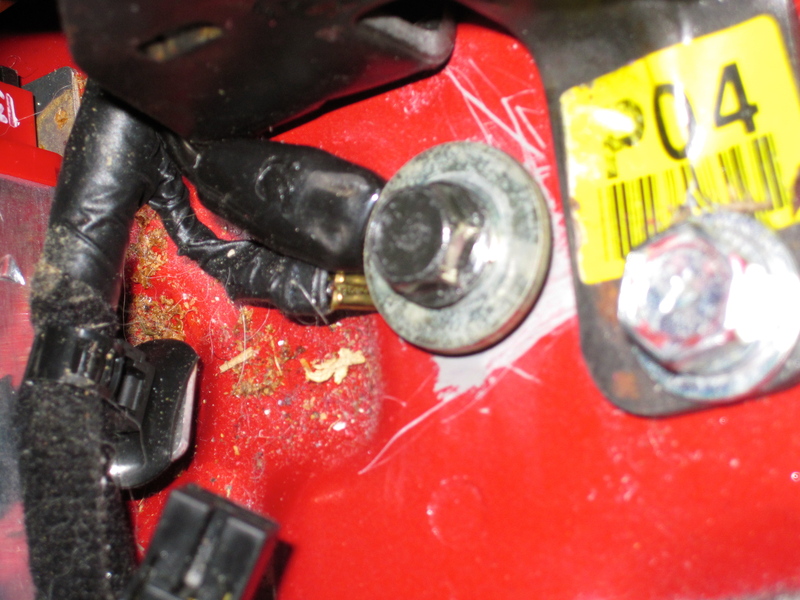 However, when you undo the screw, take it out of the hose clamp and put it to the side. Otherwise you have to crawl under the car to retrieve it when it falls out. Trust me on this. 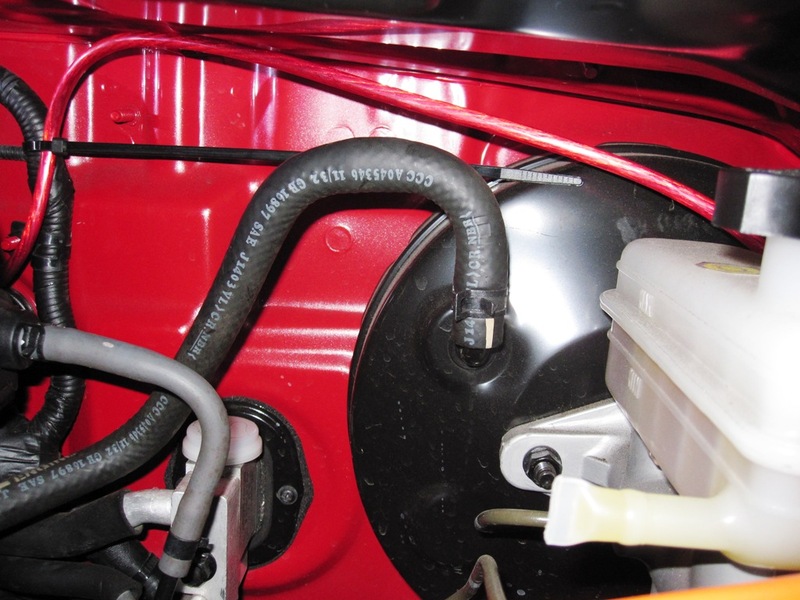 With the hose off, as you can see in the above picture, you can now easily get access to the grommet. Okay, not EASILY, but it is now possible. In the photo above you can just see the edge of it. The grommet is held in by a plate that is black, but has two red screws sticking out of it. 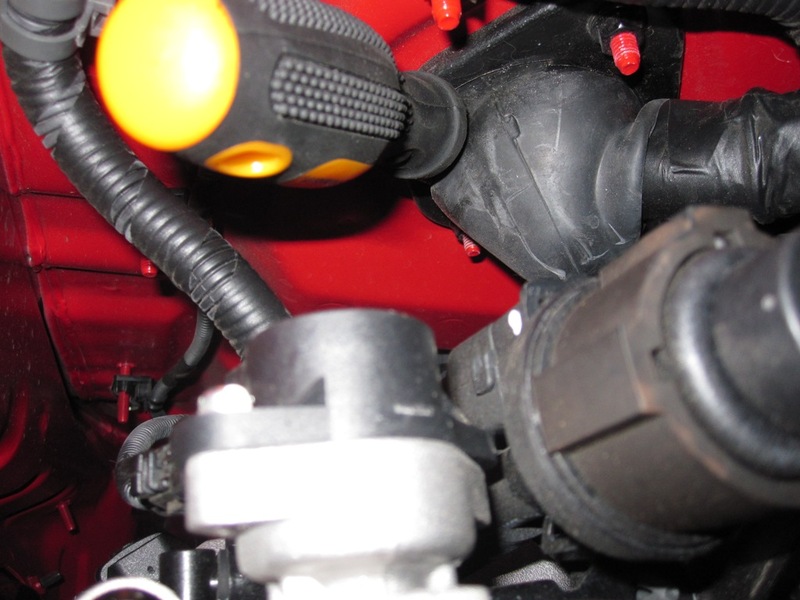 The red screw in the photo that is right next to the open metal tube where the air hose was, is part of the grommet. Now, I experimented to see if the grommet would actually lead into the cabin, and it does, but I recommend you do the following anyway because it’s good to get a feel of the path of the cable. What I did was get a flat head screwdriver and try to prize the grommet out of the housing. I did this fairly successfully, but not easily. It takes a little bit of perseverance, but you can get enough out to stick a screwdriver through it. I got the screwdriver and tried to find the path of least resistance. Proof that it can go through. But, that still presents a problem. The power cable is flexible and the screwdriver isn’t. How can I possibly push the power cable through !! Find out in the next exciting post! While we have the panels off doing the dynamat, let’s take the opportunity to lay some wiring as well. Firstly, I have to say that the amp I’m using for this can be a 2, 3 or 4 channel amp. Firstly, a “channel” is one speaker, or splits because splits are really one speaker split into tweeter and woofer. This is an over simplified definition but it works for the moment. So, 2 channel means that the amp runs two speakers (usually the front two), 3 channel is 3 speakers (usually the fronts and a sub) and 4 channel is two sets of speakers – front and rears for example. In this set up, I’m using the 3 channel option. Now, for this to work, I need to get the output from the headunit to go to the right place. For this project, I’m going to use the front speaker wire to send output to the front (duh) and the rear speakers to send output to the subwoofer. The trick here is knowing when to pass the high frequencies to the front and the sub-range or low frequencies to the sub. Luckily the amp has a switch which indicates low pass or high pass. So all of that is a bit technical, but I wanted to explain why I’m going to steal the wires from the rear speakers to run to the sub. Firstly, we need to steal the rear speaker wire. 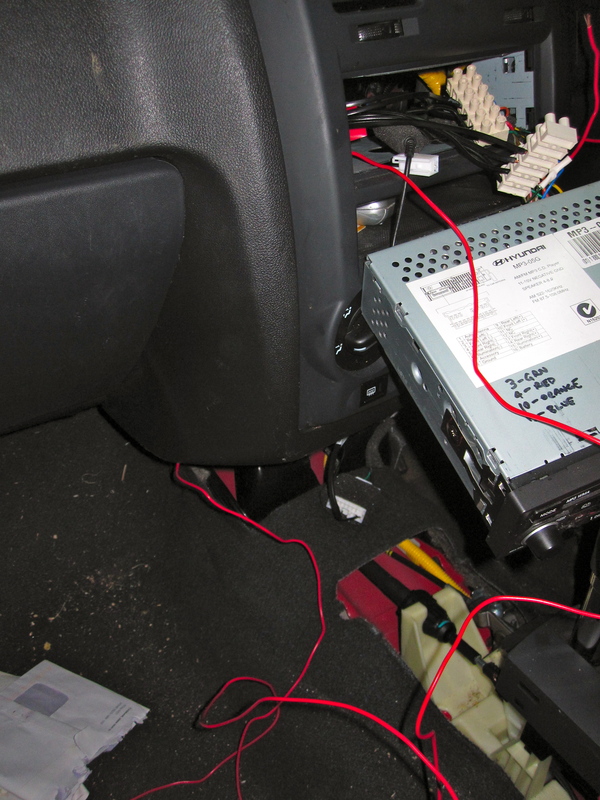 We can assume that the headunit sends it’s output to the rear speakers directly through wires. We want the headunit to send that signal to the amp and the amp to then pass that signal to the sub. 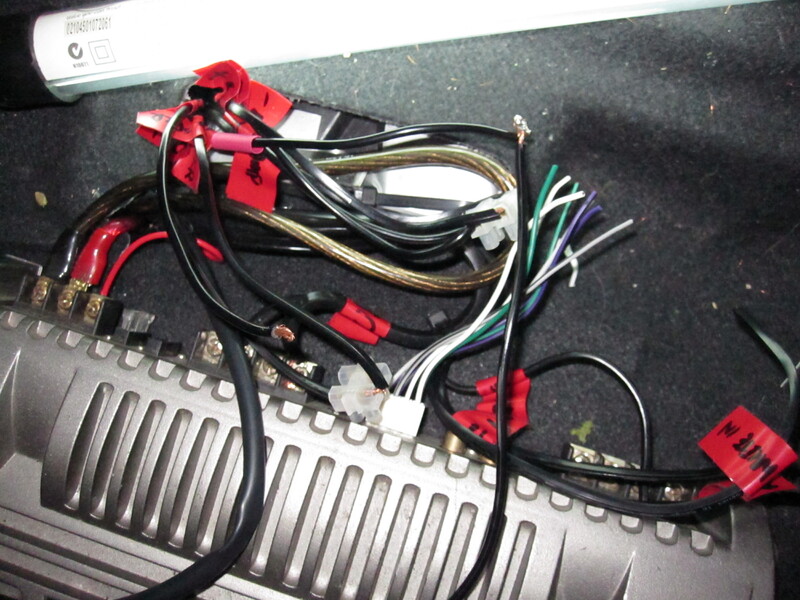 Therefore, we want to send the wires from the headunit not to the rear speakers, but to the amp. 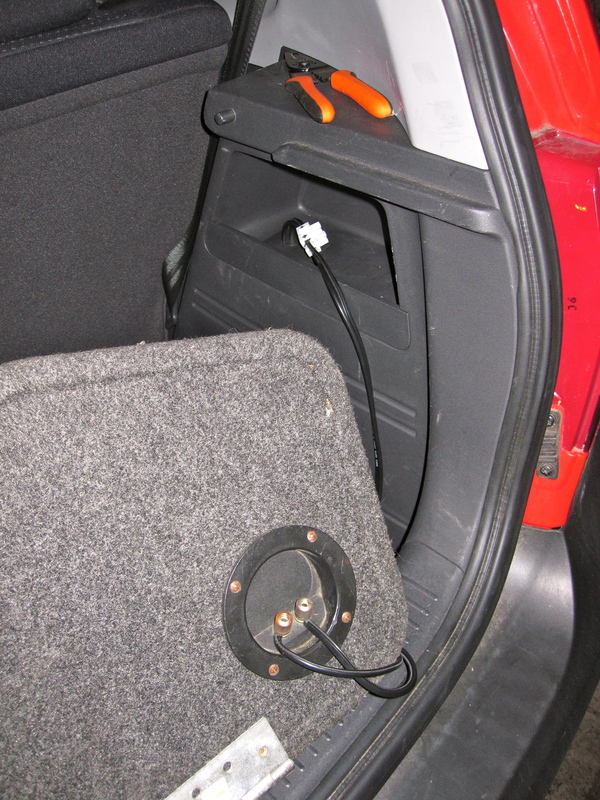 Conveniently, the rear speakers have the rear speaker wire attached to them. 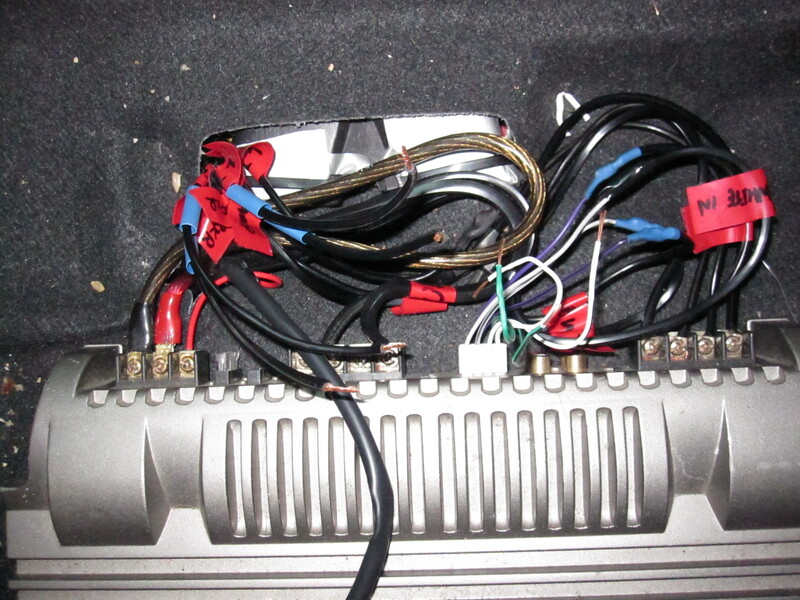 If we take those wires and plug them into the amp, that’s the rear inputs. 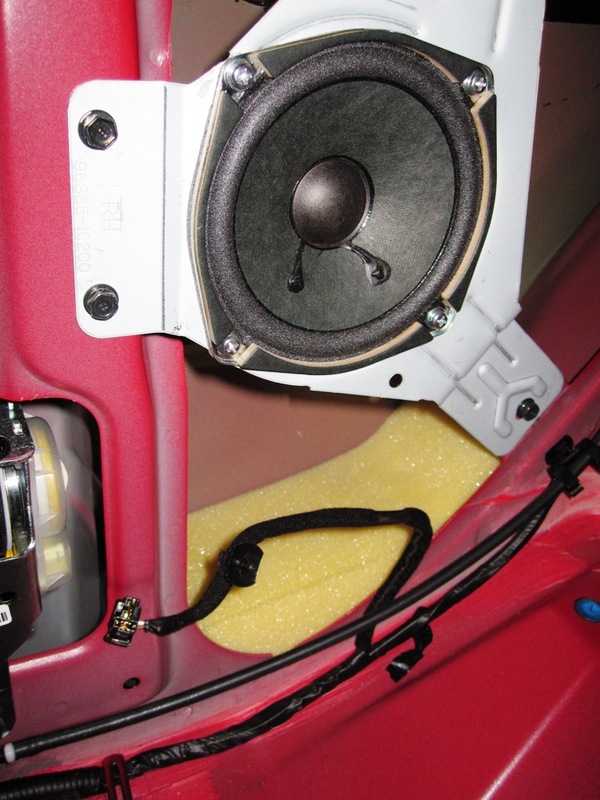 To do this, we need to remove the wire from the rear speaker and then connect that with a wire to the amp. Step one: Remove the plug connected to the rear speaker. Step 3: Prepare. Get all the stuff you’re going to need to join wires together. 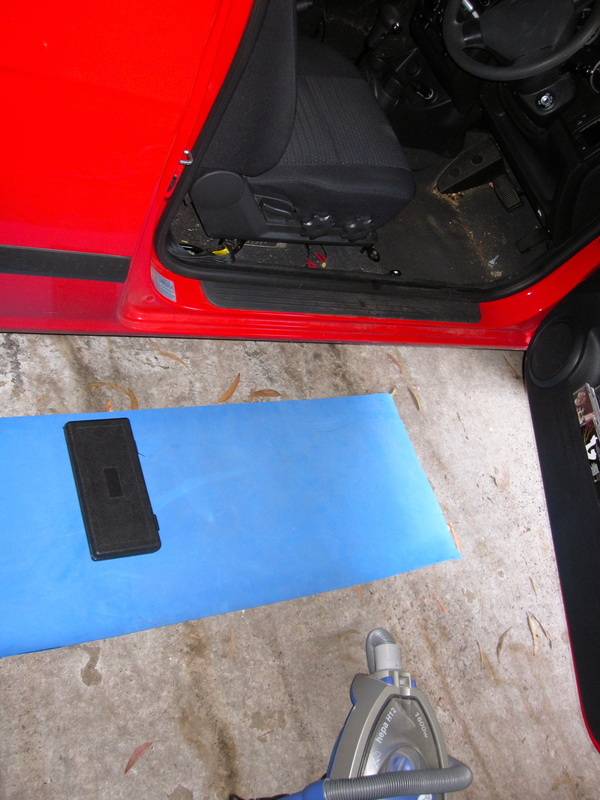 I have an old camping mat piece of foam thing that I lay near the car door to kneel on. I’ve lined up all that I’ll need so I don’t have to get up when I’m half way through something. In the above picture, on the right hand side is the soldering iron, plugged in and hot, ready to use. On the left from top to bottom, I have: Speaker wire, heat shrink, a sharpie, a roll of red electrical tape and wire strippers. At the bottom, that’s my foot. I’ll probably need that, maybe even two of them. Step 4: Be fastidious. By taking a couple of extra seconds to do stuff properly, things are a lot easier in the long run. Take the speaker wire, strip the ends. 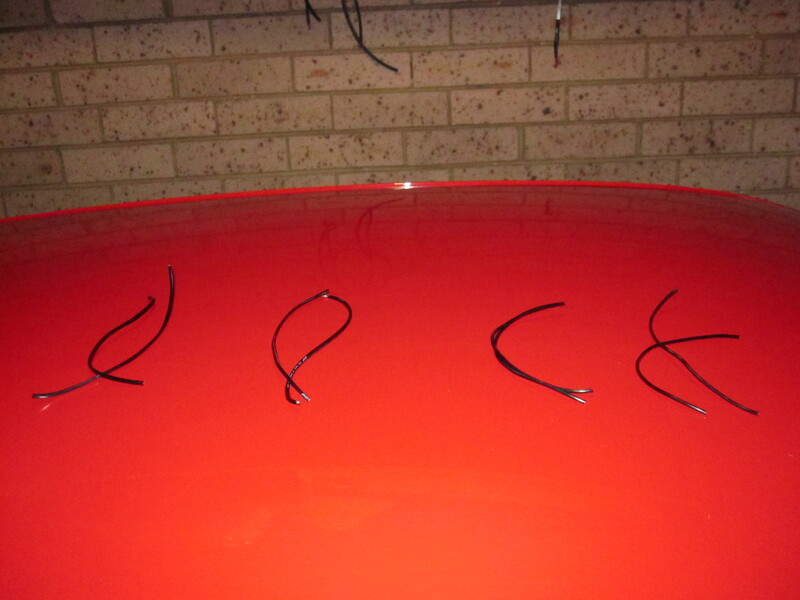 Then write on a piece of electrical tape which wire it’s connecting to and that it’s for the rear speakers. Every wire in your set up should have a label on it. If something goes wrong in future, this is the easiest way to know which wire does what. Then cut some heat shrink and slip it over the end ready for once it’s soldered. Now, do the same with the wire that was connected to the speaker. 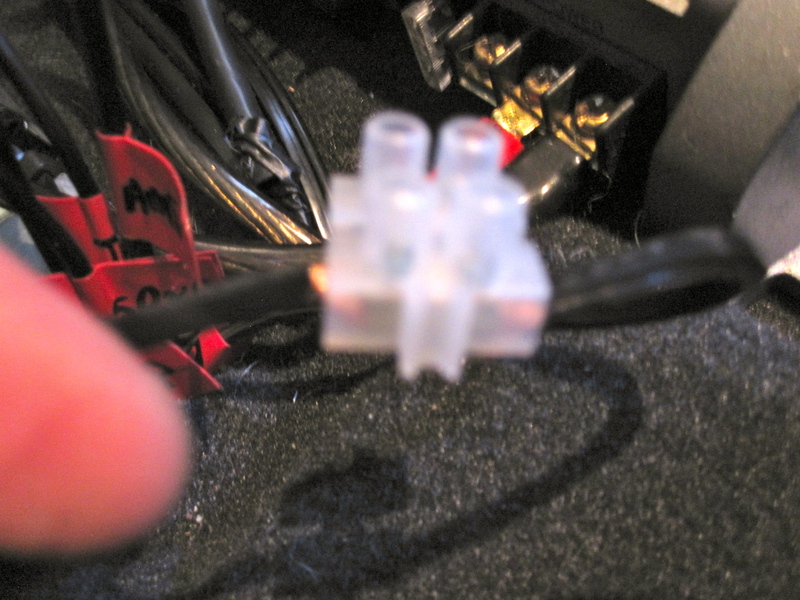 Cut the connector off, join the wires, solder them to help the connection and then heat the heat shrink over the top. I haven’t shown this step here, but earlier in the tutorial, I went into a fair bit of detail…. Step 5: Run the wire under the carpet in the same way it was laid on top. Use strips of dynamat to hold the wire down if you have some left over. 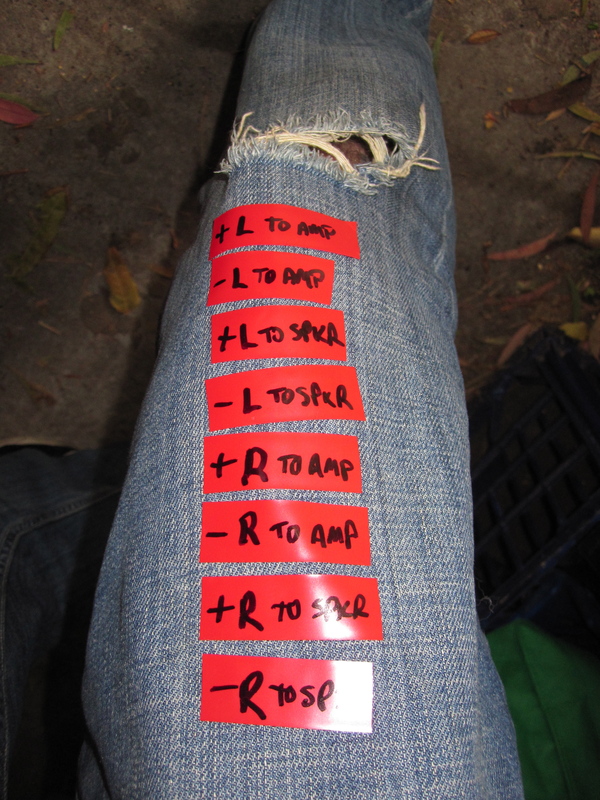 Stick the wire out near the amp (there’s a convenient hole where the wire to the seat goes) and label those ends too. You’ll need to know that stuff when it comes to connecting them to the amp. 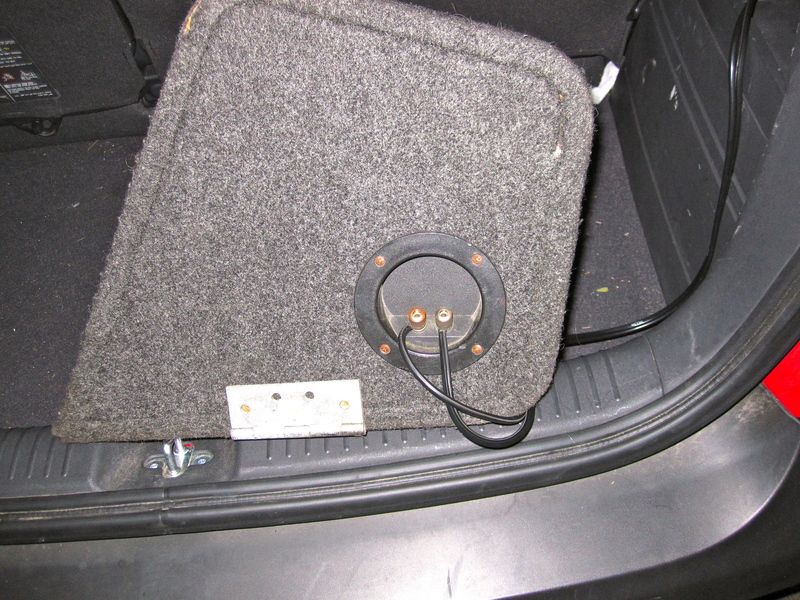 In the photo above, you’ll see that I’ve done both rear speaker wires and labelled them with IN. Then I’ve also run the sub wire while I was there and had the trims off. 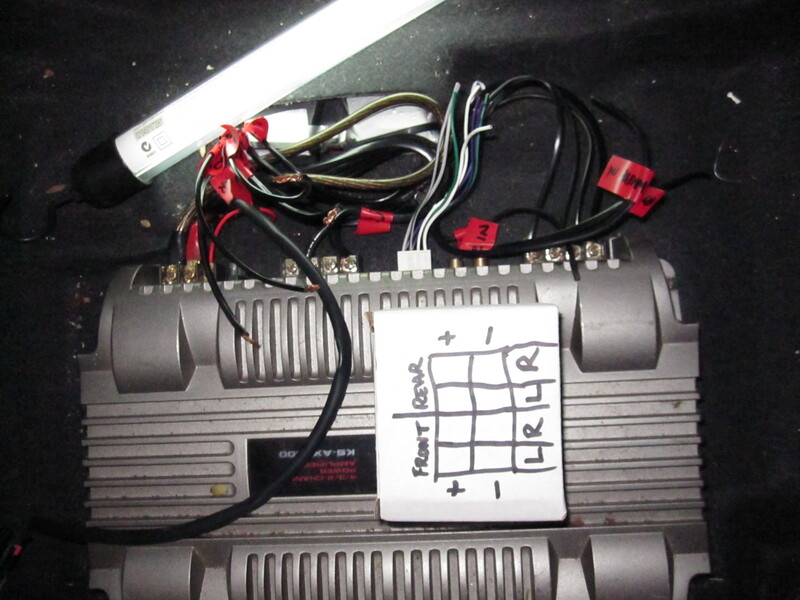 I just ran a decent length of it to the boot following the other wiring paths. I’ve labelled it as well. So now that’s all done, we can start to put things back together. All you need to do is pretty much everything but in reverse. Two things I wanted to point out though. 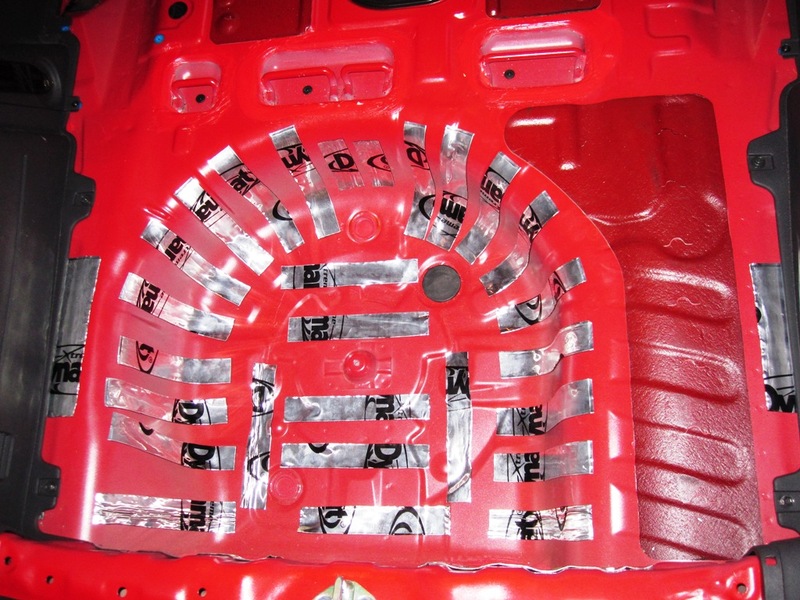 Firstly, as you’re putting the rear quarter panel on, think about how we’re going to get the wiring to the sub. I found a nice little cover inside the shelf area that I thought would be a nice neat way to run the wiring. I drilled two holes in it, stuck the wiring through and then replaced the cover. These wires will then be connected to the sub. I’ll show more about that later when we actually hook it up. For now at least the wires are there. (Note the below photo shows them, but prior to me labelling them). This should be enough to go a long way to stopping vibrations coming out of there. So, now everything is back together, we only have two things left to do. 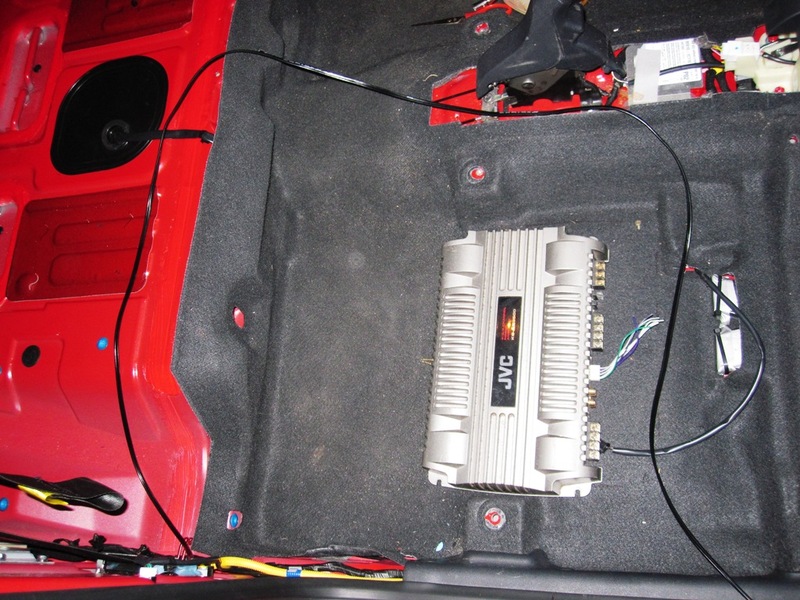 1) Pull out the head unit and run the wiring to the amp, and 2) POWER!!!!! The next post will be all about getting power!